There will be named parking spaces for Tangata Whenua Members in the HBRC car park – entry off Vautier Street. At the present time, the quorum is 14 members. Best endeavours will be made to achieve decisions on a consensus basis, or failing consensus, the agreement of 80% of the Committee members in attendance will be required. Where voting is required all members of the Committee have full speaking rights and voting entitlements. 1. On the list attached are items raised at Regional Planning Committee meetings that staff have followed up. All items indicate who is responsible for follow up, and a brief status comment. Once the items have been reported to the Committee they will be removed from the list. That the Regional Planning Committee receives the report “Follow-up Items from Previous Meetings”. 1. That the Regional Planning Committee accepts the following “Items of Business Not on the Agenda” for discussion as Item 13. 1. The Hawke’s Bay Regional Planning Committee Act 2015 (the Act) established the Regional Planning Committee in statute. a procedure for determining the remuneration to be paid to tāngata whenua members and reimbursement of their expenses. 3. 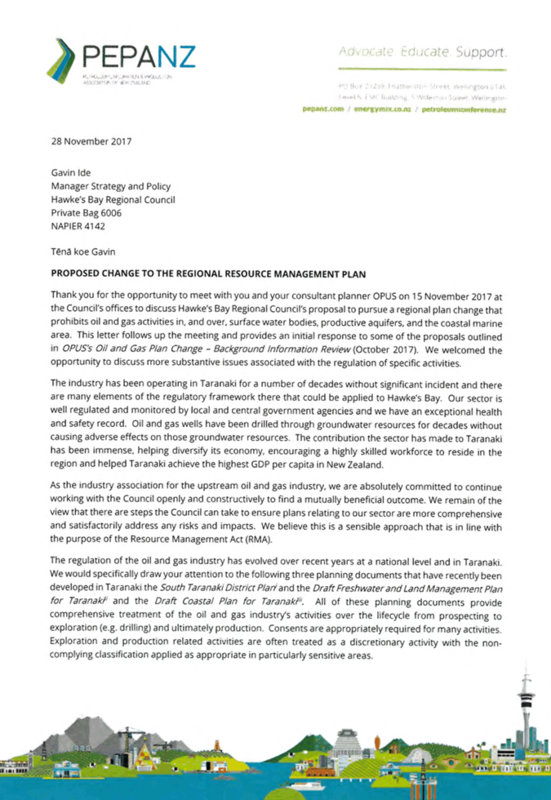 Any amendments to the Terms of Reference must be with the written unanimous agreement of the appointers (this includes tāngata whenua appointers and the Council). 4. When the Regional Planning Committee first began to operate ahead of the passing of the legislation payment of tāngata whenua members was based on a Cabinet Office Circular on the Fees Framework for Members of Statutory and Other Bodies appointed by the Crown. 5. The intent of the review of the Terms of Reference included a review of the procedure for determining payment. On the advice of the tāngata whenua Chair and Co-Chair of the Committee, Mr. David Shannon was appointed to undertake the remuneration review. 6. 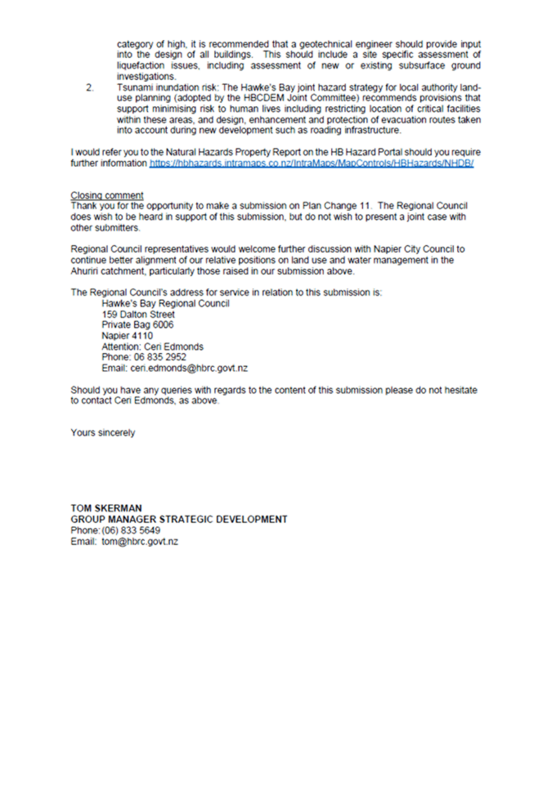 A copy of Mr Shannon’s report is attached. It has previously been provided to all members of the Regional Planning Committee for discussion at workshops. 7. Mr. Shannon’s report provides recommendations for both the Regional Planning Committee and the Maori Standing Committee. For the purpose of this paper the proposed remuneration for the tāngata whenua members of the Regional Planning Committee is the only matter for discussion. 8. The requirement for the Terms of Reference is that it must identify a procedure for determining the remuneration to be paid to tāngata whenua members and the reimbursement of their expenses. 9. The Shannon Report utilised market data broadly comparable to fulltime local government and public sector positions, Cabinet Office Circulars, professional salary surveys and personal experience to correlate the payment for tāngata whenua RPC members broadly to Senior Policy Advisors in a local Council. Mr. Shannon recommended that this equated to $500 per meeting day for members (plus $500 per tāngata whenua hui day, prior to the formal RPC). The estimated income from this per member is $8,000 per annum based on the number of meetings held. His report also acknowledged the need for additional remuneration to the Co-Chair in recognition of the additional responsibilities. 10. Feedback from a workshop of the tāngata whenua members of the Regional Planning Committee indicated a level of disappointment in the findings and a request for more information. Following discussions between the Co-Chairs, Deputy Co-Chairs and HBRC staff an offer has been provisionally made to the tāngata whenua members and they will have considered this offer by the time of the Regional Planning Committee meeting (but after the agenda is published). 11.1. Payment of $12,000 per annum per tāngata whenua member of the Regional Planning Committee. This payment will cover preparatory work, attendance at tāngata whenua-only hui, attendance at the formal Regional Planning Committee meeting, and any required follow–up meeting with appointers. 11.4. Payments to be reviewed annually in accordance with the comparable salary for Senior Policy Advisors, as outlined in the Shannon Report. 11.5. HBRC to continue to make payments separately for the reimbursement of travel, accommodation and incidental expenses as per current arrangements upon receipt of verified claims. 12. For the purpose of clarification payment to any tāngata whenua member who represents the Regional Planning Committee on any other body, such as a standing committee of HBRC or a sub-committee, is not covered by this arrangement and is determined separately. 13. In addition the payment for any independent advice sought by the tāngata whenua members of the RPC will continue to be made separately by HBRC. 14. 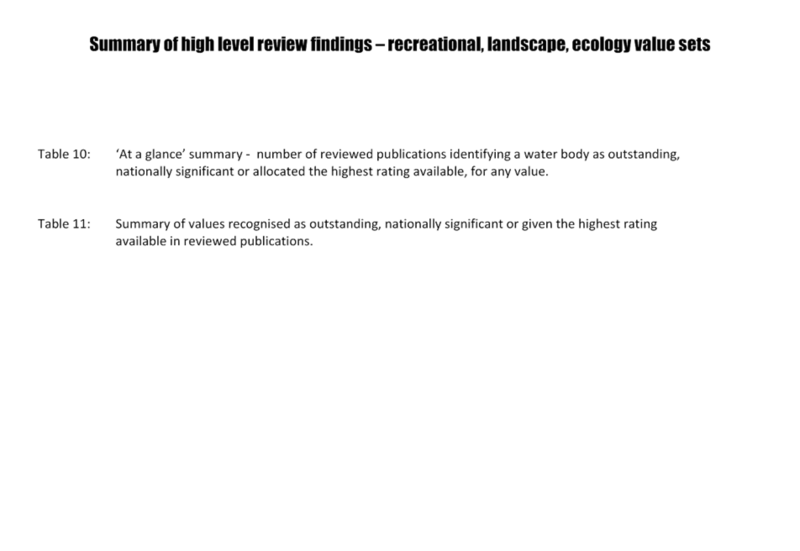 HBRC has provided for the level of remuneration described in this paper in its Draft Long Term Plan. 15.4. The persons affected by this decision are the ratepayers in the Hawke’s Bay region who meet the costs of the Regional Planning Committee. 15.5. The decision is not inconsistent with an existing policy or plan. 15.6. Given the nature and significance of the issue to be considered and decided, and also the persons likely to be affected by, or have an interest in the decisions made, Council can exercise its discretion and make a decision without consulting directly with the community or others having an interest in the decision. 1. Receives and notes the Remuneration Review report. 2. Agrees that the decisions to be made are not significant under the criteria contained in Council’s adopted Significance and Engagement Policy, and that Council can exercise its discretion and make decisions on this issue without conferring directly with the community and persons likely to be affected by or to have an interest in the decision. 3. 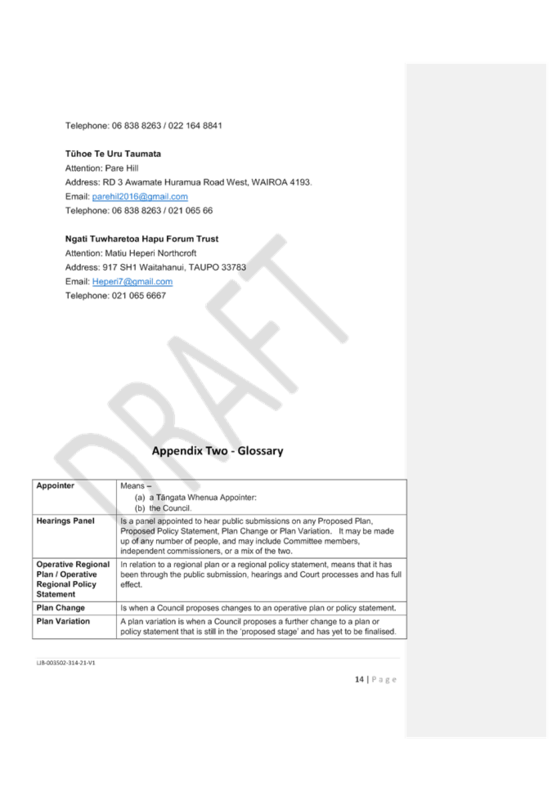 Recommends that for the purposes of the review of the Terms of Reference for the Regional Planning Committee that the procedure for the remuneration of the tāngata whenua members of the Committee is as outlined in paragraph 11 of this paper and that annual payment reviews use market data for Senior Policy Advisors in the public sector as the baseline. 4. Recommends that the Council implements the payment system in paragraph 11 of this paper, with effect from 21 March 2018. 1. This item identifies and discusses a number of matters requiring resolution that have either been raised by committee members in relation to the Regional Planning Committee terms of reference, or are mandated by the Hawke’s Bay Regional Planning Committee Act 2015. 2. The Regional Planning Committee was established in April 2011 as an interim committee pending the commencement of the Hawke’s Bay Regional Planning Committee Act 2015 (the Act). 3. The Act’s preamble ultimately recorded the Crown’s commitment to establish a committee whose role would relate to natural resource planning processes that affect the region, and include drafting and recommending to the Council, plan and policy changes affecting natural resources in the region. 4.4. to instruct staff to bring back to Council, the proposals in relation to participation in voting. 7.2. stipulates that the terms of reference may be amended by the written unanimous agreement of the Appointers. Note – “Appointer” means the Council and the trustees or governors of the nine organisations whom each appointed or retain the right to appoint a tangata whenua representative to the committee. In this regard the terms of reference (which allows for an amendment to the terms of reference through a 80% resolution of committee members) are inconsistent with the Act and therefore the Act is deemed to prevail. That is, any amendment to the Terms of Reference requires a simple majority resolution of Council and unanimous written approval of all trustees/directors (acting with authority) who are a tangata whenua party to the Act. 7.3. confirms that the terms of reference must be consistent with the specified legislation (the Act, local government legislation and the RMA). 8. Accordingly, while there is a requirement for the RPC to ensure that the current terms of reference are consistent with the specified legislation, there is no compulsion to review or amend the current terms of reference. 9. On 20 May 2015 the Committee considered whether the terms of reference should be amended to include broader resource management functions that were then undertaken by the Environment and Services Committee (i.e. more than overseeing preparation, review and amendments of RMA planning documents such as the Regional Policy Statement, Regional Resource Management Plan and Regional Coastal Environment Plan). 11. 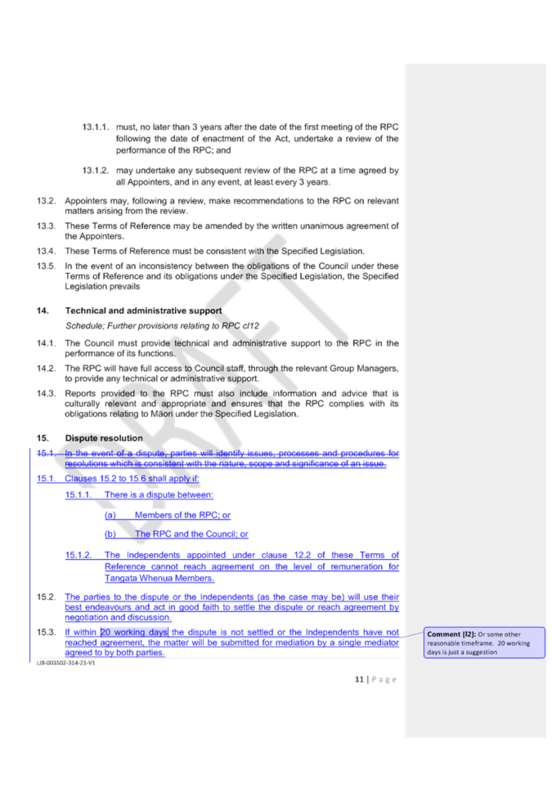 TWR members requested staff prepare documentation to illustrate the current terms of reference (November 2013) marked up with draft amendments as discussed by the sub-group. Refer to Attachments 2 and 3 for copies of Ms Blomfield’s advice and Attachment 4 for the Ms Blomfield’s marked up terms of reference. 12.1.3. Consensus decision making and the 80% voting threshold. 12.2. The presumption that the current Standing Orders of Council apply to the operation of the committee unless amended by the committee. 12.3. 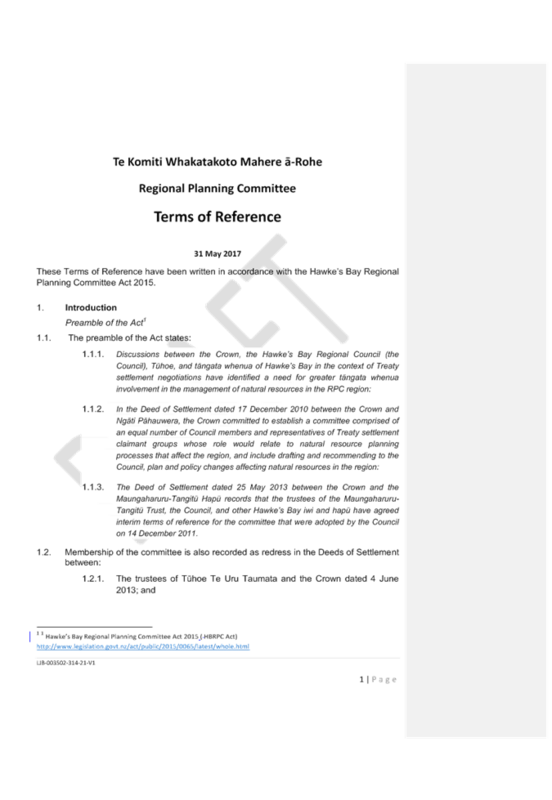 Confirmation of functions and powers of the committee (noting the legal advice that the broader scope in draft terms of reference is not inconsistent with the specified legislation). 12.5. Remuneration provisions (to be addressed in a separate agenda item presented at the 21 March RPC meeting). 13. Clause 10(2)(a) of the Act’s Schedule states that the Appointers “must, no later than 3 years after the date of the first meeting of the RPC, undertake a review of the performance of the RPC.” Following this statutory review, the Appointers may make recommendations to the RPC on relevant matters arising from the review. Assuming that this section is tied to the first meeting of the RPC following the date the Act came into effect then this review should be undertaken by September 2018. 14. While the scope of such a review appears very broad and is a matter for the committee to give consideration to, because both the statutory review and any amendment to the terms of reference are matters for consideration and ratification by the Appointers, there is merit in aligning both processes. 15. Provided that the committee can settle the remaining issues on the proposed terms of reference (per para 12) and resolve to refer same to Council and tangata whenua appointers for their respective organisations’ ratification, then staff consider the terms of reference would sensibly fall within the ambit of the wider statutory review requirement. 16.6. Resourcing of the above. 1. That the Regional Planning Committee receives and notes the “Regional Planning Committee Terms of Reference and Review” staff report. 2.1. Confirms which of the matters set out in paragraphs 12 and 16, and/or which additional matters, are to be resolved by the committee prior to undertaking of the statutory review of the performance of the RPC. 2.2.4. Meeting and reporting timeframes. 1. This report sets out a number of options for the selection of a list of candidate outstanding water bodies (OWB) in order to progress the OWB Plan Change. This report does not present a finalised list of the region’s OWBs. 2. Additionally, this report summarises a number of issues which were discussed at the Regional Planning Committee’s meeting in June 2017. 3.1 In June 2017, the Hawke’s Bay Regional Council (HBRC) endorsed an approach that was co-designed with the tāngata whenua representatives of the Regional Planning Committee (RPC) to identify outstanding water bodies (OWB) in the Hawke’s Bay region. To date, substantial progress on this work programme has taken place. 3.2 The OWB plan change puts in place an important framework to ensure the region’s most treasured water bodies are protected for future generations. 3.3 It cannot be assumed that because a water body is outstanding today that it will still be outstanding in 10 years, particularly if an appropriate management regime is not put in place. 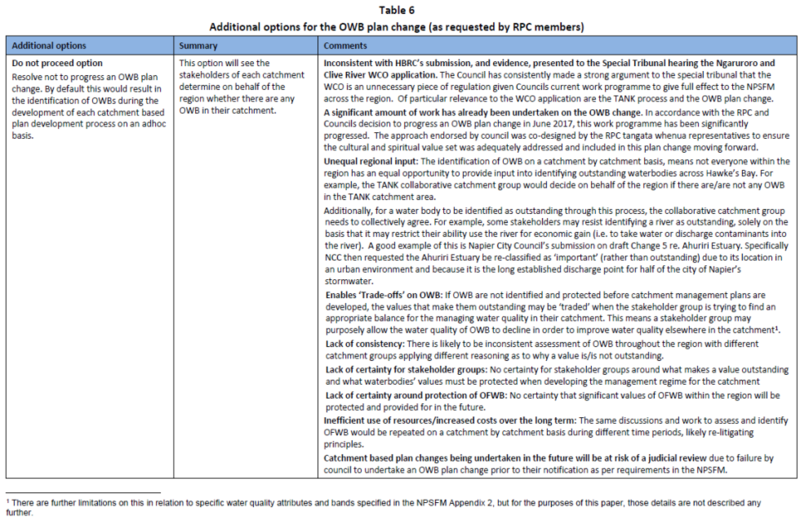 3.4 If an OWB plan change is not progressed, OWB will identified by catchment management groups on an inconsistent, adhoc basis across the region, with unequal regional input. Additionally, all future catchment based plan changes 1 may be subject to a judicial review and subsequently delayed. 3.5 The timing of the OWB plan change in relation to TANK needs to be reconsidered due to recent developments with the Ngaruroro Water Conservation Order (WCO) application. 3.6 The OWB plan change does not lessen the importance of other water bodies. All water bodies are being considered as part of a NPSFM implementation programme which is currently being progressed by the Council. 3.7 A decision on a candidate list of OWB for the recreational, landscape and ecological value sets needs to be made at the March meeting, with a decision being made on the cultural and spiritual value set at the 2 May RPC meeting at the latest. This will aid in demonstrating to the WCO Tribunal that the Council is progressing the identification of OWB across the region, and allow for the notification of the plan change prior to TANK plan change notification. 4. Our coastal and fresh waters are essential to New Zealand’s economic, environmental, cultural and social well-being. These waters are highly valued for their cultural and recreational aspects and underpins important parts of New Zealand’s biodiversity and natural heritage. 5. Regional councils are tasked with ensuring all of the country’s water bodies are managed wisely. The National Policy Statement for Freshwater Management (NPSFM) and the New Zealand Coastal Policy Statement set national direction to assist regional councils to manage water bodies in a consistent, integrated and sustainable way. 6. A number of New Zealand’s lakes, rivers and coastal areas are iconic and well known globally for their natural beauty and intrinsic values. The NPSFM recognises this, and provides for those exceptional water bodies to have special protection. This protection does not lessen the importance of, or value associated with, other water bodies, which are to be managed as directed by other provisions in the NPSFM. 7. The Hawke’s Bay Regional Council is currently working through an implementation programme which will provide an improved management framework for all water bodies in the region, giving full effect to the NPSFM by 2025. The implementation programme involves a number of region wide, and catchment based, workstreams. 8. The OWB Plan Change is a small but important workstream that is not confined to any single catchment area. It is being undertaken as part of the overall NPSFM implementation package, ensuring that those ‘special few’ water bodies in Hawke’s Bay are protected for future generations. 9. In 2017, in response to the application for a WCO on the Ngaruroro and Clive Rivers, the Regional Council clearly advocated to the Government and the Special Tribunal that a WCO is an unnecessary and disruptive piece of regulation when set against the new policy setting created under the NPSFM. 10. HBRC has consistently made a strong argument that the NPSFM implementation package adopted for Hawke’s Bay comprehensively manages the region’s resources without the need for a WCO instrument. Evidence was presented during the Stage 1 WCO hearings in support of this argument, particularly noting the two high priority workstreams currently being progressed by Council as being the TANK collaborative process and the OWB plan changes. 11. What happens if a water body is not identified as outstanding? 12. Just because a waterbody is not recognised as ‘outstanding’ does not mean it is not important. The NPSFM and councils overall work programme will continue to recognise, and provide for waterbodies within Hawke’s Bay which are of high value, together with tāngata whenua’s special cultural, spiritual, historical and traditional associations with all waterbodies. 13. The catchment-based work programmes will focus on improving the management of freshwater to protect the life supporting capacity of our rivers, lakes, streams, wetlands and aquifers. These programmes will identify values, set objectives and develop policies and methods (including rules) for managing all water bodies – regardless of ‘outstandingness’ to ensure overall water quality is maintained or improved. Degraded water bodies will also need to be given special attention during those catchment based processes. 14. Should HBRC be focussing on restoring degraded water bodies instead of protecting water bodies which are already outstanding? 15. Both of these work streams are important. The regions degraded water bodies need to be restored, and so too do any outstanding waterbodies in Hawke's Bay need to be protected to ensure they are still around to be enjoyed by future generations. The Council’s planning response needs to accommodate both. It cannot just choose to do one or the other. 16. It cannot be assumed that because a water body is outstanding today that it will still be outstanding in 10 years, particularly if the correct supporting management regime is not put in place. 17. The OWB plan change would put in place a key part of the planning framework to ensure the region’s most treasured water bodies are protected for future generations. It achieves this by ensuring that each of the catchment management plans in the region protect the significant values of OWB moving forward. 18. Committee members will recall that HBRC partnered with Auckland Council and Ministry for the Environment to delve into the intent behind the outstanding freshwater bodies provisions in the NPSFM. Following completion of the project the focus has been on preparation of HBRC’s own OWB plan change. 19. In June 2017, the Council endorsed an approach that was co-designed with the RPC tāngata whenua representatives to identify outstanding water bodies across the region. 20. Based on that agreed approach, staff have undertaken a high level literature review documenting the cultural, spiritual, recreational, landscape and ecological values associated with water bodies across the region. This was done to build a clearer picture of their value and potential for being classified as outstanding. 21. To date, a total of 130 named water bodies in the Hawke’s Bay region have been reviewed using an extensive range of documents. This work has been specifically undertaken to assist the RPC when deciding on a list candidate of OWB. 22. The results of this high level review are summarised in Attachment 2, and Attachment 3. A full version of the high level review will be presented to the RPC committee members at the workshop on 21 March 2018. What is an outstanding water body? 23. An outstanding water body is considered as being exceptional in some way. It represents a high threshold and for this reason it is expected that only a small number will be identified across the country. This was one of several conclusions reached from the earlier work sponsored by MFE. 25. In June 2017, the RPC and Council agreed that in order to a water body to be classed as outstanding, it must contain at least one cultural, spiritual, recreational, landscape or ecological value which stands out from the rest on a national basis. 26. The selection process for the cultural and spiritual value set has been undertaken separately from the recreational, landscape and ecological value sets, using different methodologies which directly reflect the different types of information reviewed for these value sets. 27. There is no strictly right or wrong approach to identify OWBs. The options in this report present a number of selection thresholds and result in between 20 to 51 candidate outstanding water bodies for further assessment. The final list of candidate outstanding water bodies will be subject to a secondary analysis which will assess what (if any) water bodies contain values that are clearly superior to other water bodies on a national basis. 28. It is recommended that Option C3 for the cultural and spiritual value set, and Option R4 for the recreational, landscape and ecological value sets, be adopted. Both options have high selection thresholds. Staff consider those high selection thresholds are consistent with the intent of the NPSFM that a relatively small number of outstanding water bodies should be identified across the country. 29. Over the past few months, planning staff have been liaising with the RPC tāngata whenua representatives’ advisors which has led to a new option being considered for the cultural and spiritual value set (Option C4). This involves the creation of a list of candidate OWB by the RPC tangata whenua representatives, using their extensive knowledge, in lieu of Option C3. This option will be explored at the hui held with the RPC tangata whenua representatives on 20 March 2018, and reported back to the wider committee membership at the workshop the following day, on 21 March. 30. Additionally, several more options are presented in this paper in response to questions raised at the Co-Chairs’ agenda setting meeting for the RPC. 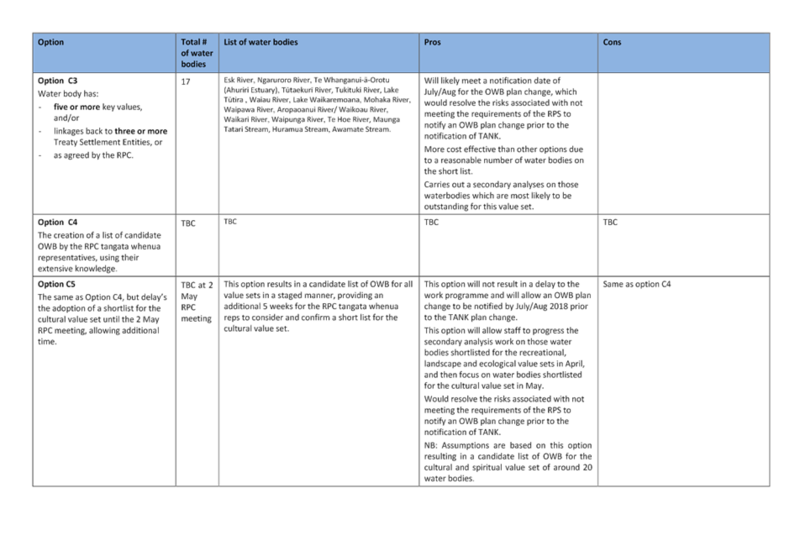 These are summarised as follows, with a detailed analysis contained in Attachment 1. 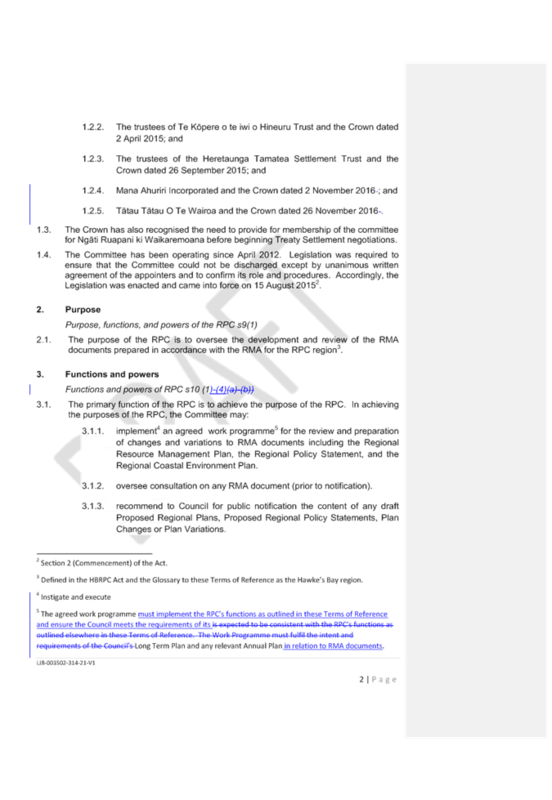 30.1 Option C5 – the same as Option C4 but delays the adoption of a shortlist for the cultural value set until the RPC meeting scheduled for 2 May 2018. This deferral could provide additional time for the RPC tangata whenua reps to consider and confirm a short list for the cultural value set. NB: This option does not result in a delay to the work programme as it would allow the secondary analysis for the recreational, landscape and ecological value sets to be progressed in April, and the secondary analysis for the cultural and spiritual value set to follow and be progressed in May. 30.2 Do not proceed option – This option would see the RPC reverse their June 2017 decision and resolve not to progress an OWB plan change. OWBs would be identified during the development of each catchment based plan development process on an adhoc basis, with unequal regional input. 30.3 All outstanding option – This option would see all waterbodies in the region identified as ‘outstanding water bodies’ in the Regional Policy Statement. Again, this would reverse the RPC’s earlier agreed approach reached in June 2017. 30.4 Delay option - This option delays the adoption of a shortlist for all value sets until a future RPC meeting, providing additional time for the RPC members consider and confirm a list of candidate OWB which would move through for secondary analysis. NB: This option would delay the work programme, meaning an OWB plan change would not realistically be ready for public notification around July-August 2018. 31. This report provides a summary of the key selection options for the creation of a list of candidate OWB. Staff intend elaborating on these options during the Committee members’ pre-meeting workshop on 21 March. 32. Four options have been developed to assist with identifying outstanding water bodies that have significant cultural and spiritual values. 33. Options C1 – C3 have been developed by HBRC planning staff and include those water bodies which have five or more key values, and/or customary linkages back to two or more treaty settlement entities, or as agreed by the RPC. 34. Options C4 and C5 are two new options which have been developed as alternatives to Options C1 – C3. Option C4 uses tāngata whenua traditional knowledge of their values related to water bodies, information from the Cultural Values Table and agreed criteria to identify the relevant cultural and spiritual values of water bodies. Option C5 is the same as Option C4, but delays the adoption of a shortlist for the cultural and spiritual vale set until the May RPC meeting. 35. All options are summarised in Table 1 below. 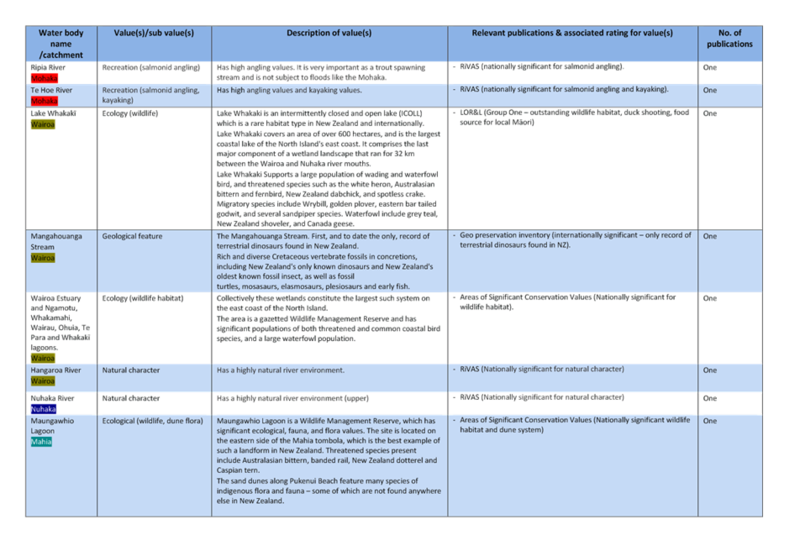 Table 1: Summary of selection options – cultural and spiritual value set. Add other waterbodies as agreed by RPC? 37. Option C2 is the most conservative option resulting in 47 water bodies. It ensures a secondary analysis is carried out on wide range of water bodies by shortlisting all water bodies which have four or more key values and/or linkages back to three or more Treaty Settlement Entities, or as agreed by the Regional Planning Committee. 38. Option C3 reduces the list of candidate outstanding water bodies to 17, by only including those water bodies which have five or more key values and/or linkages back to three or more Treaty Settlement Entities, or as agreed by the Regional Planning Committee. 39. New alternative option (C4): A new alternative option is currently being considered by the RPC tangata whenua representatives for the cultural and spiritual value set. The option involves creating a list of candidate OWB by the RPC tangata whenua representatives, using their extensive traditional and cultural knowledge, in lieu of Options C1 - C3. The RPC tangata whenua representatives will be exploring this option and its real-life application further at their hui on 20 March. The tāngata whenua representatives will report back to the wider committee membership and staff during the pre-meeting workshop on 21 March. Figure 1 below, shows Option C4 in a picture form. 40. New alternative option (C5): Option C5 is the same as Option C4, but delays the adoption of a shortlist for the cultural and spiritual vale set until the RPC meeting on 2 May 2018. This would offer the tangata whenua representatives more time to consider a short list. This option would not result in delays to the OWB plan change by allowing staff to progress secondary analysis work on those water bodies shortlisted for the recreational, landscape and ecological value sets in April, with the secondary analysis commencing on water bodies shortlisted for the cultural and spiritual value set in May. 41. Developing a shortlist of potentially outstanding water bodies based on cultural values is a challenging task. This is primarily because only those iwi and/or hapū who exercise mana over a waterbody can practically assess the significance of its cultural values to that waterbody. As such, it is difficult to compare the relative significance of different water bodies between two iwi or hapū groups across the region. 42. 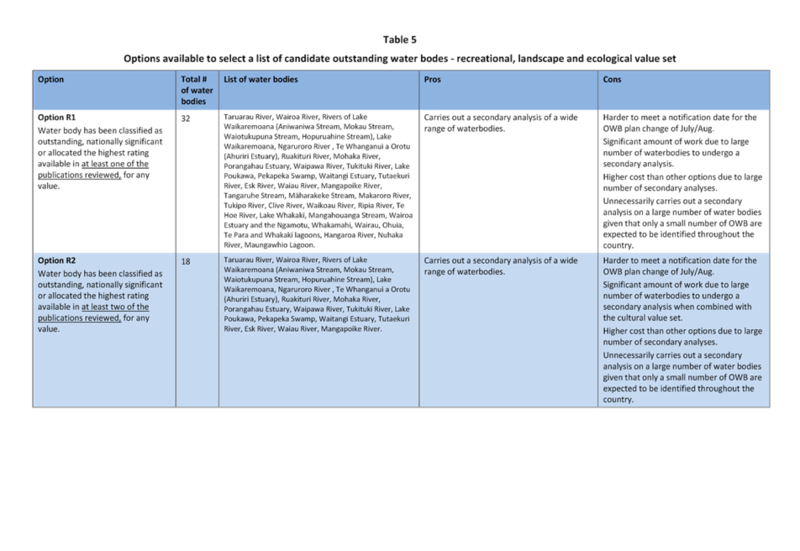 Options C1 – C3 deliberately avoid comparing the identified values at this stage, and instead measures the number of identified values and number of different Treaty settlement entities who have customary linkages back to a particular water body. 43. 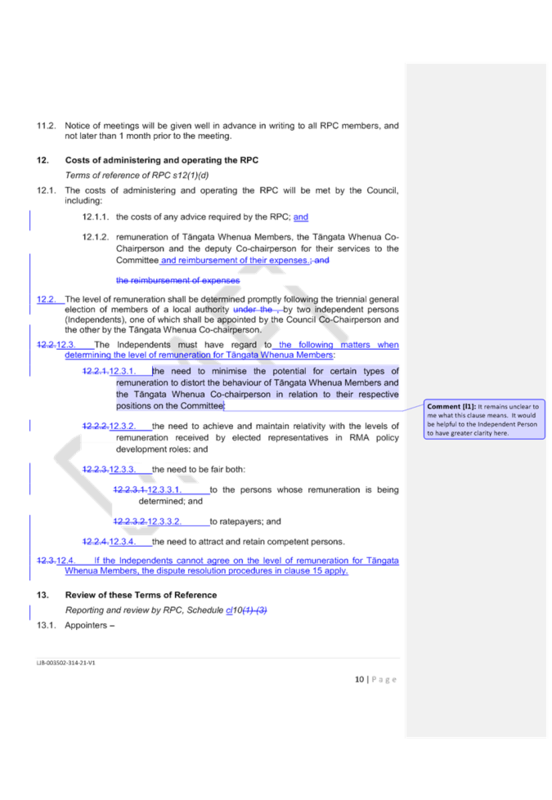 A detailed analysis of Options C1 – C5 with an associated list of candidate OWB, is contained in Attachment 1. 44. Four principal options have been developed to assist with selecting a list of candidate outstanding water bodies for further assessment for the recreational, landscape and ecology value sets. 45. There are many rivers, lakes and coastal areas within Hawke’s Bay which are of high value to the people who live in this region. However as discussed in this report, in order for a water body to be identified as ‘outstanding’ it must be exceptional in some way. For example the water body must contain values which are clearly superior to others in the same group. 46. Accordingly, the following options only include those water bodies which contain a value that has been assigned an outstanding, nationally significant or allocated the highest rating in one or more of the reviewed publications. 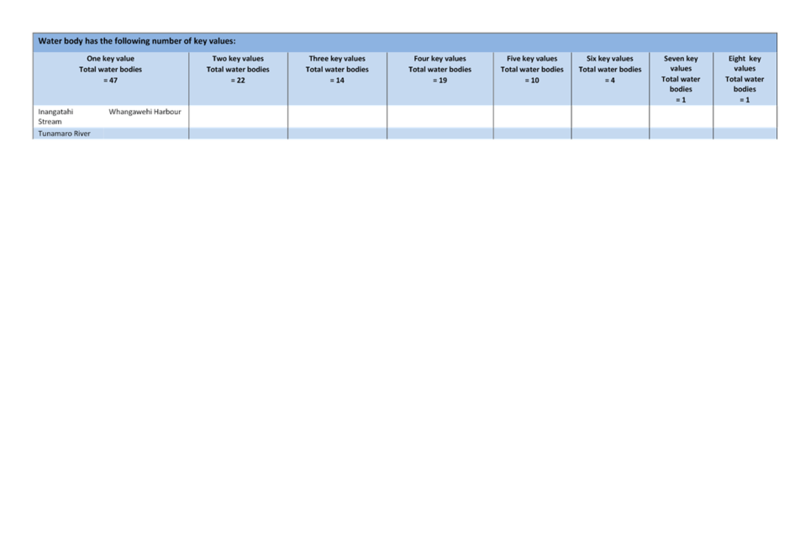 Table 2 sets out these options in tabular format. 47. Option R1 is the most conservative option. It ensures a secondary analysis is carried out on wide range of water bodies by shortlisting all 32 water bodies which have been classified as either outstanding, nationally significant or allocated the highest rating available, for any value, in at least one of the publications reviewed. 48. Option R2 reduces the list of candidate outstanding water bodies to 18, by only including those water bodies which have been identified as either outstanding, nationally significant or allocated the highest rating available, for any value, in at least two of the publications reviewed. 49. 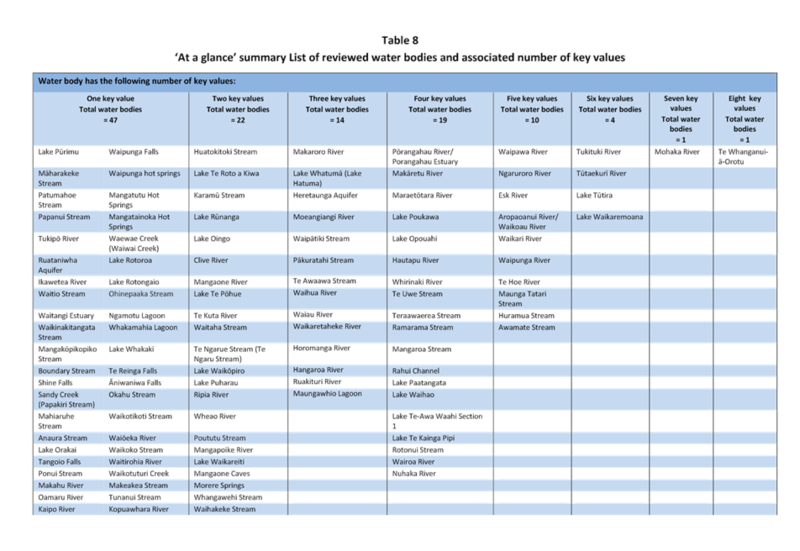 Option R3 reduces the list to 8, by including only those water bodies which have been identified as either outstanding, nationally significant or allocated the highest rating available, for any value, in at least three of the publications reviewed. 50. 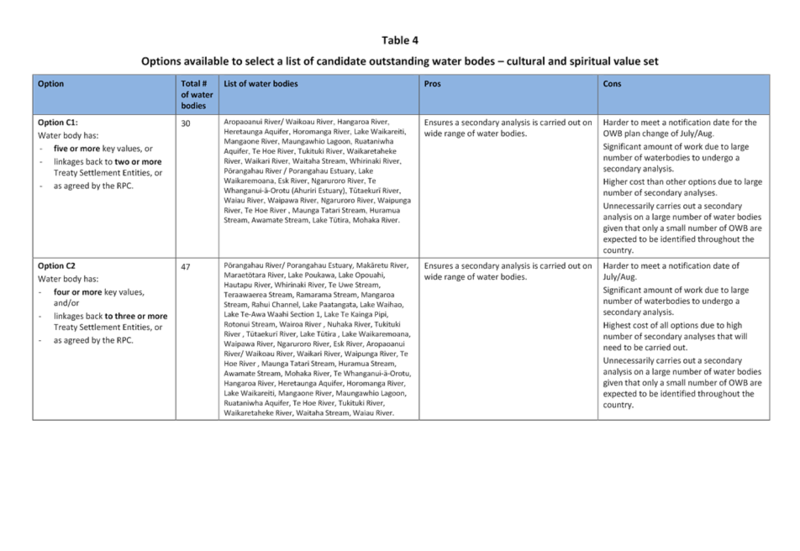 Option R4 is the same as Option R3, plus those water bodies which have been identified as internationally significant in at least one of the publications reviewed, for any value. Option R4 results in a list of 10 candidate outstanding water bodies. 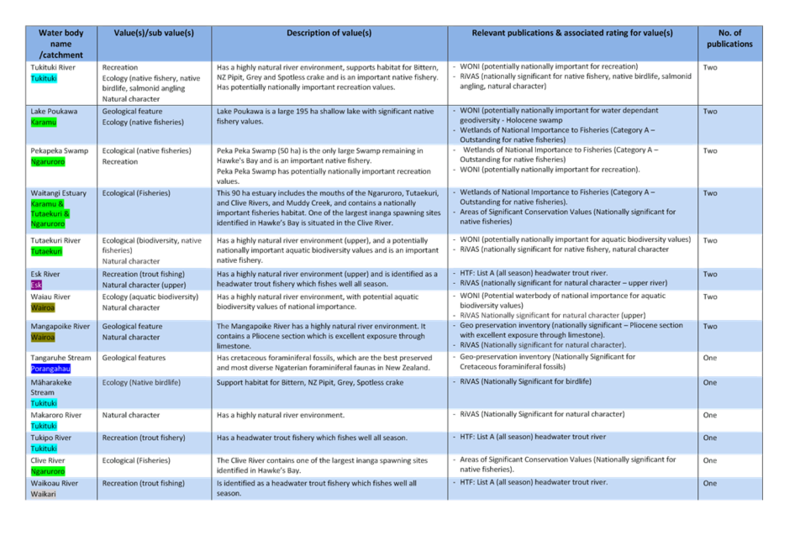 Table 2: Summary of selection options – recreational, landscape, ecology values set. Minimum number of publications which identify any value as either outstanding, nationally significant or allocated the highest rating available. Minimum number of publications which identify any value as internationally significant. 52. 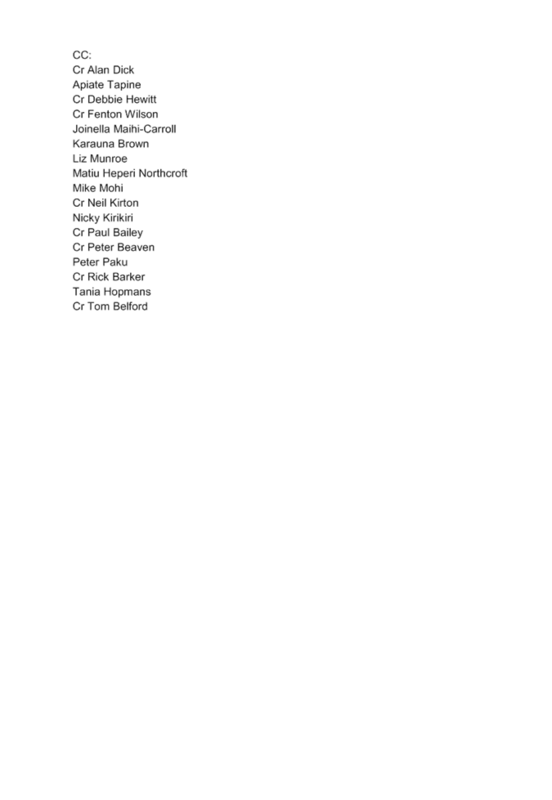 A detailed analysis of each option, with an associated list of candidate OWB, is contained in Attachment 1. 53. An outstanding water body is one which is exceptional in some way. It may be exceptional in relation to one particular feature, or it may have a number of outstanding features, which stand out on a national basis. Generally, when something is outstanding it should be obvious (in general terms) to the community and there is no need for expert analysis. 54. Given this high threshold, it is recommended that Options C3 for the cultural and spiritual value set and Option R4 for the recreational, landscape and ecological value sets be adopted for selecting a list of candidate OWBs for further assessment. Recommended Option C3 may be replaced with either Option C4 or Option C5 at the RPC’s meeting on 21 March. 55. 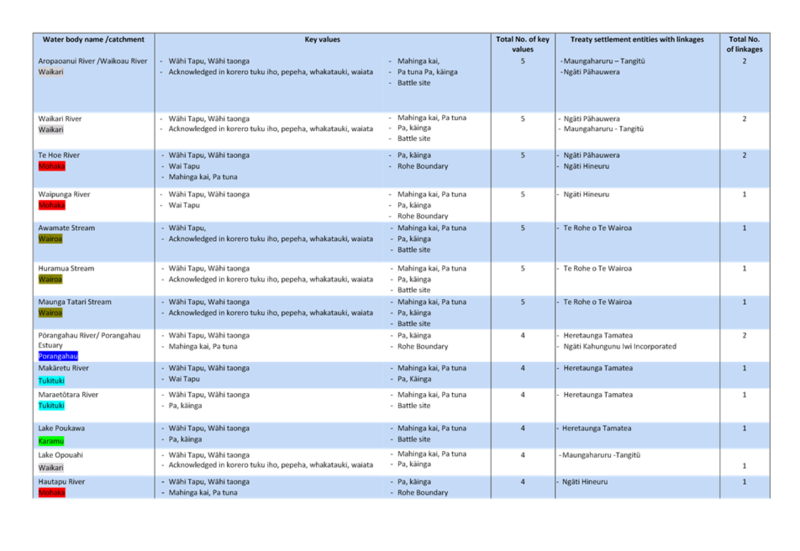 The recommended options are outlined below in Table 3. Both options have high selection thresholds which short list those water bodies in Hawke’s Bay which are most likely to contain a particular value that stands out in a national context. - As agreed by the RPC. - being internationally significant in at least one of the publications reviewed, for any value. 56. The OWB plan change was identified as one of Council’s standalone policy projects over six years ago, when the Government revised the NPSFM to direct greater protection of the significant values of outstanding water bodies. 57. To ensure the identification of OWB occurred across the region using a consistent framework, it was decided to undertake the OWB plan change on a ‘whole-of-region’ basis, rather than through numerous individual catchment area changes to regional plans. 58. Despite the OWB plan change being identified in Council’s work programme, a number of submitters to Change 5 to the RPS requested various water bodies across the region be identified as outstanding. These submissions were not accepted by the hearings panel and appeals to the Environment Court were subsequently lodged against Change 5 in this respect. 59. As a result of some points in those appeals, a mediated agreement between parties resulted in the RPS being amended to incorporate a new policy stating that identification of outstanding water bodies would be completed and any associated changes to the RPS be publicly notified prior to the next catchment-based regional plan change2. 60. That new policy in Change 5 (Policy LW1A) was inserted during the appeal phase to address appellant parties’ concerns that an OWB plan change would not be a priority nor progressed at all by the Council. 61. At the RPC meeting in June 2017, the Committee was advised of Change 5’s new Policy LW1A regarding sequencing of notification of a OWB plan change prior to the notification of the TANK plan change (and other catchment-based plan changes, except the Mohaka catchment). 62. The Committee was advised in June 2017 about the key risk of not complying with this procedural requirement - being the potential for any party to file judicial review proceedings with the high court and consequently result in challenges and delays to the Council’s freshwater planning work programme – particularly the TANK plan change. 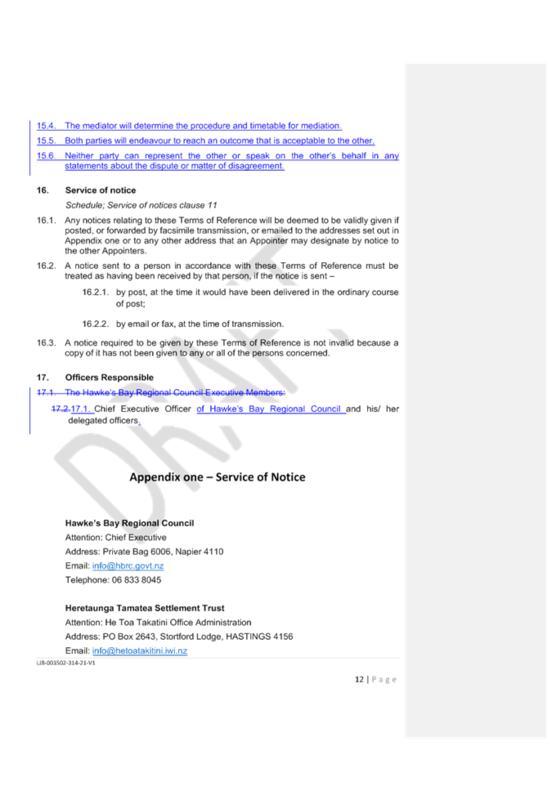 63.2. advised staff despite the risks associated with notifying the OWB plan change after the TANK plan change, the Committee were comfortable for staff not to adhere to this time frame. 64. Since June 2017, Stage 1 of the WCO hearings have been completed by the Minister-appointed Special Tribunal. In December 2017, the WCO Special Tribunal adjourned their proceedings until July 2018 to allow HBRC science, and talks between TANK members, to progress. 65. At the end of the adjournment period, the Tribunal has invited submitters to file memoranda on the progress of the TANK process specifically noting if any consensus between the members has been reached. If no memoranda are filed, then the Special Tribunal will proceed with Stage 2 of the WCO hearings. 66. The Regional Council has consistently made a strong argument that a WCO was as unnecessary piece of regulation when set against new and emerging regional planning policy since the advent of the 2014 NPSFM. Those arguments were a key feature of the Regional Council’s written submission to the Special Tribunal, plus in evidence presented during Stage 1 hearings. The Council’s argument made it abundantly clear that it was actively progressing work on both the OWB and TANK plan changes. 67. As a result of the Tribunal’s pronouncement regarding adjournment and commencement of its hearings, the TANK group is on a tighter timeframe and working towards consensus by May/June 2018, aiming for a draft plan change by August/September. These timings would enable the Special Tribunal to take the Group’s hard-grafted outputs into account during the Stage 2 hearings. 2 By this time, PC6 for the Tukituki catchment was already well-advanced, and the amended RPS provision had also exempted the Mohaka catchment from the timing sequencing requirements. 68. With the Tribunal having signalled the prospect of Stage 2 hearings commencing mid-2018, staff recommend the RPC reconsider its earlier direction and approach for timing and sequencing of the OWB plan change relative to the TANK plan change. Planning staff also recommend that the Committee agrees to progress the OWB plan change in a manner that would aim for a realistic notification date of June/July 2018, and the TANK plan change being publicly notified thereafter to ensure that neither plan change is unnecessarily challenged by potential High Court judicial review proceedings. What happens if a decision on candidate OWBs cannot be made? 69. There are several alternatives if the RPC cannot make a decision on a candidate list of outstanding water bodies. The consequences of not making a decision at the 21 March RPC meeting will spill over into future RPC meetings scheduled for remainder of the year. 70. The RPC may wish to extend the timeframe for identifying a list of candidate outstanding water bodies to the 2 May RPC meeting, to provide additional time to consider the large quantity of information put forward as part of this paper. 71. While this is possible, if the list of candidate OWB for further assessment is not confirmed until May, it is virtually inevitable that a July/August notification date for the OWB plan change will not be achieved. 72. As per Option C5, the RPC may choose to confirm a list of candidate OWB for the recreational, landscape and ecological value sets at the March RPC meeting, deferring a decision on a short list for the cultural and spiritual value set, until the 2 May RPC meeting. This option would not result in a delay to the overall OWB workstream. 73. This is the default option if an OWB plan change cannot be progressed now or in the future. The default alternative has limited direct input by the RPC, with OWB being determined on a piecemeal basis between 2018 and 2025, through whatever relevant catchment stakeholder groups may be established for discussing policy options for the ‘rest of the region’ catchments (i.e. besides Tukituki and TANK). 74. This approach does not guarantee any consistency to the identification of OWB throughout the region, nor any certainty that cultural values will be robustly assessed or that OWB will be adequately protected during the development of each of the remaining catchment-based plan change projects. 75. This approach does not meet the requirements of RPS Policy LW1A, which means all catchment based plan changes1 undertaken in the future will be potentially at risk of a judicial review because of the timing and sequencing issue. Further, this ‘default’ approach would also be contrary to the Regional Council’s second edition of its NPSFM2014 Progressive Implementation Programme. 76. Subject to a short list of candidate outstanding water bodies being confirmed at the March RPC meeting, the following outlines next steps and associated timeline are anticipated for the OWB Plan Change. 77. As per Stage 3 of the project approach, the list of candidate outstanding water bodies will be subject to a secondary analysis. The secondary analysis is intended to provide a more detailed description of the values associated with each candidate outstanding water body. 78. After completion of the secondary analysis, consultation will occur with iwi authorities, territorial authorities and key stakeholder groups3 regarding the candidate list of OWBs. During this period, a generic feedback form would be an additional feature in the OWB webpage for other parties or members of the public who wish to provide general comments. 79. Additionally, in April 2018, three hui-a-iwi, in the ‘Northern’, ‘Central’ and ‘Southern’ parts of the region, are being planned to discuss the Oil and Gas plan change project. A brief update on the OWB plan change is proposed to take place at the same time at the three hui. Dates for the hui are still being confirmed. 80. In June 2018, the findings of the secondary analysis, and associated consultation, will be reported back to the RPC (meeting on 20 June). The uninterrupted work programme would lead to recommendations for a draft OWB plan change being ready for the RPC’s consideration and adoption as a ‘draft plan change’ at that same meeting (Stages 4 and 5 of the project approach). 81. As per new requirements of recent amendments to the RMA, a draft plan change will provided to all iwi authorities in Hawke’s Bay and their comments invited. Thereafter, a finalised plan change will be presented to the RPC meeting on 1 August for consideration, and if adopted, then subsequent public notification as a ‘proposed plan change’. 82. Tāngata whenua have special cultural, spiritual, historical and traditional associations with freshwater. The relationship between Tāngata whenua and freshwater is founded in whakapapa, which is the foundation for an inalienable relationship between Māori and freshwater that is recorded, celebrated and perpetuated across generations. Freshwater is recognised by Māori as a taonga of paramount importance. 83. The approach to identifying OWB in the region has be co-designed with the tāngata whenua representatives of the RPC to ensure tāngata whenua values are addressed as part of a robust process to identify OWB. 84. All waterbodies are important for spiritual, physical and customary reasons. The OWB plan change does not act to lessen the importance of waterbodies that are not labelled ‘outstanding’ or change the way in which these waterbodies are managed. The plan change is one of a number of work programmes proposed as part of the Council’s overall NPSFM progressive implementation package that focuses on improving the management of freshwater to protect the life supporting capacity of our rivers, lakes, streams, wetlands and aquifers. 85.1. The decision does not significantly alter the service provision or affect a strategic asset. 85.2. The decision does not significantly alter the service provision or affect a strategic asset. 85.3. The use of the special consultative procedure is not prescribed by legislation. 85.4. The decision does not fall within the definition of Council’s policy on significance. 3 Hawke’s Bay Fish and Game, Department of Conservation, Hawke’s Bay branches of Forest & Bird Society. 85.5. The persons affected by this decision are all persons with an interest in the region’s management of natural and physical resources under the RMA. 85.6. The decision is not inconsistent with an existing policy or plan. 85.7. Given the nature and significance of the issue to be considered and decided, and also the persons likely to be affected by, or have an interest in the decisions made, Council can exercise its discretion and make a decision without consulting directly with the community or others having an interest in the decision. In any event, there will be an opportunity for any person to make a submission on a proposed plan change once it is adopted and publicly notified. 1. That the Regional Planning Committee receives and notes the “List of Candidate Outstanding Water Bodies in Hawke’s Bay” staff report. 2.2. 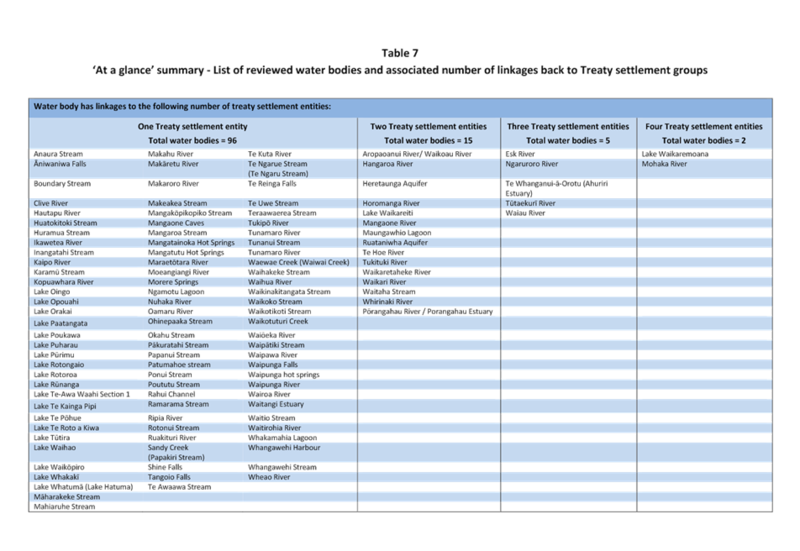 Agrees that the list of candidate outstanding water bodies which will be subject to a secondary analysis as per Option R4 for the recreational, landscape and ecology value sets as follows. 2.3. Agrees that the list of candidate outstanding water bodies which will be subject to a secondary analysis as per Option ____ for the cultural and spiritual value set being the list as follows. 2.4. 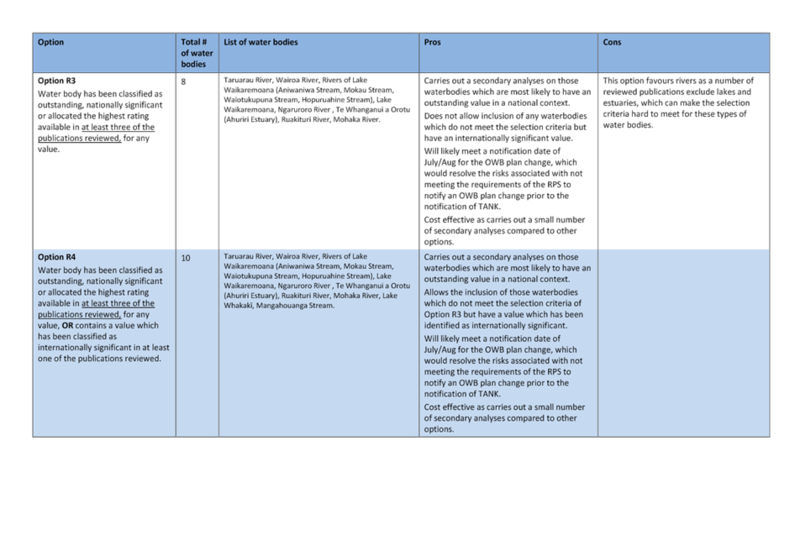 Agrees for staff to proceed with consultation with the following parties in relation to the secondary analysis for the candidate outstanding waterbodies as listed in 2.2 and 2.3 above. 2.4.3. Hawke’s Bay Fish and Game Council, Department of Conservation and the Hawke’s Bay branches of the NZ Forest and Bird Protection Society. 2.5. Acknowledges the potential risk to the TANK plan change project and Council’s wider freshwater planning work programme if an outstanding waterbodies plan change is not notified prior to the TANK plan change. 1. This report recaps the Oil and Gas plan change work to date, and provide an update on next steps. Following this, there will be two presentations, firstly from Walter Breustedt, and secondly from Cameron Madgwick on behalf of Petroleum Exploration and Production Association of NZ (PEPANZ). Both presenters have been invited to the RPC meeting at the request of the Committee co-chairs. 2. At the November 2016 Council meeting, Council requested that the RPC consider proposing a plan change to prohibit the drilling for oil and gas within the region’s productive aquifers and surface water bodies. 3.3. Progress discrete stand-alone plan change. 4. The RPC preference was for a stand-alone plan change and a recommendation was made to Council on that basis. 5.4. A region-wide prohibition would seem difficult to justify if challenged in courts based on past Environment Court case law. 6. Simpson Grierson’s advice also outlined some of the practical steps that would be required to progress the plan change. 7. At the March 2017 RPC meeting, an indicative work programme for the oil and gas plan change was presented. 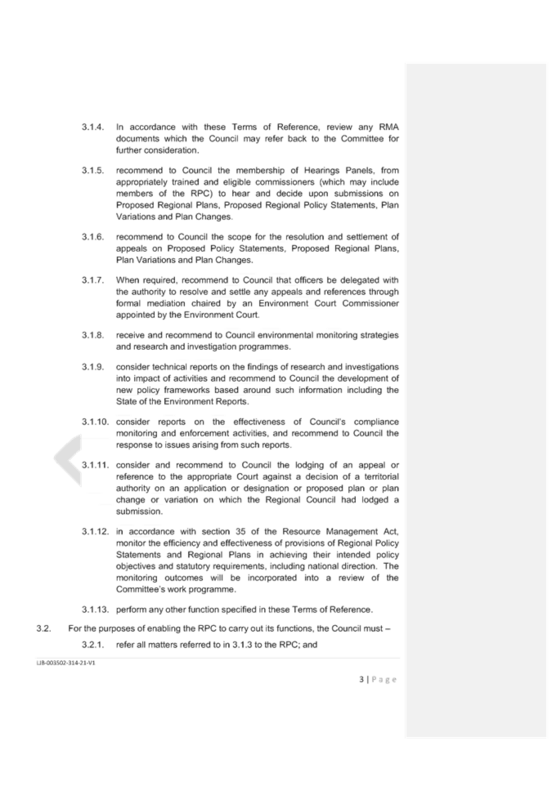 This proposed public notification of a plan change in late 2017 and decisions by mid-2018. 8. Opus International Consultants (Opus) were engaged in April 2017 for an initial scoping phase. This included a staff workshop and the presentation of some high level issues and objectives to the RPC for feedback. A workshop was held with RPC members in June 2017. Through that scoping phase, the coastal marine area was also included for consideration in any future plan change options. The scoping phase helped inform a more detailed project plan and Opus were engaged to progress the remainder of the plan change. 9. The project plan included the following stages. 9.3. 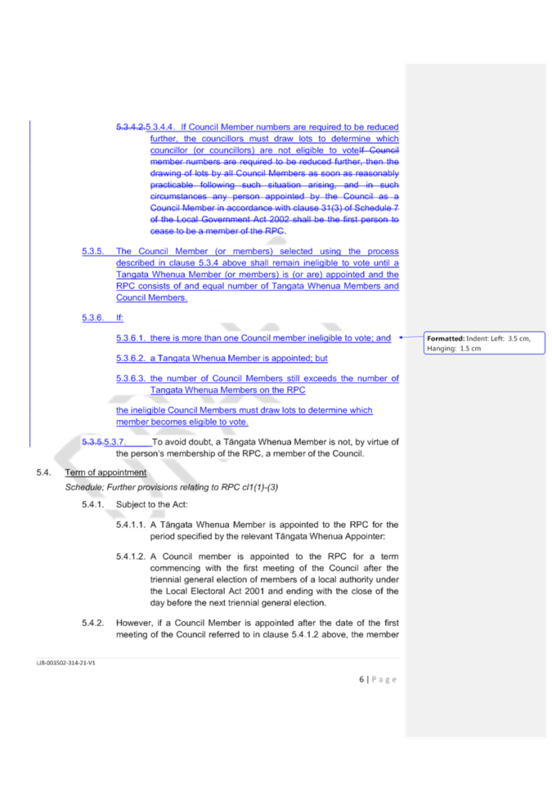 Section 32 Analysis and Drafting Plan Amendments. 11. It also included some high level plan change options that could be used as a starting point for stakeholder discussions. 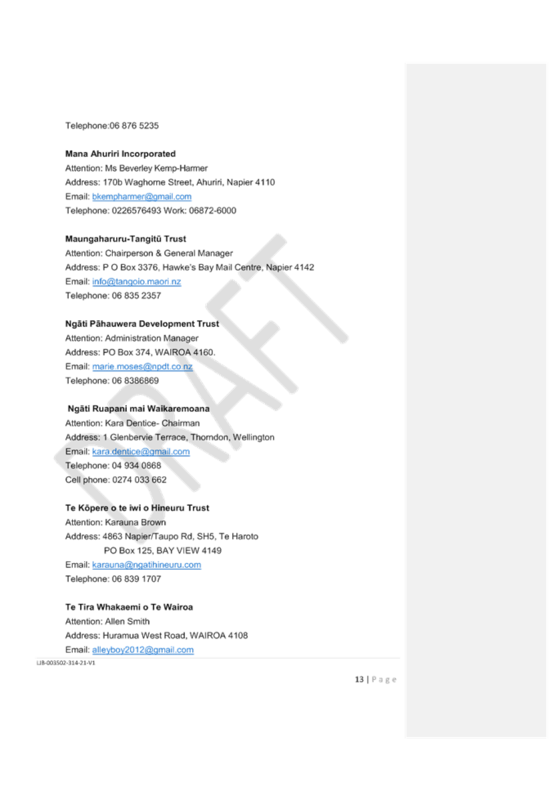 That discussion document was not a draft plan change. 12. 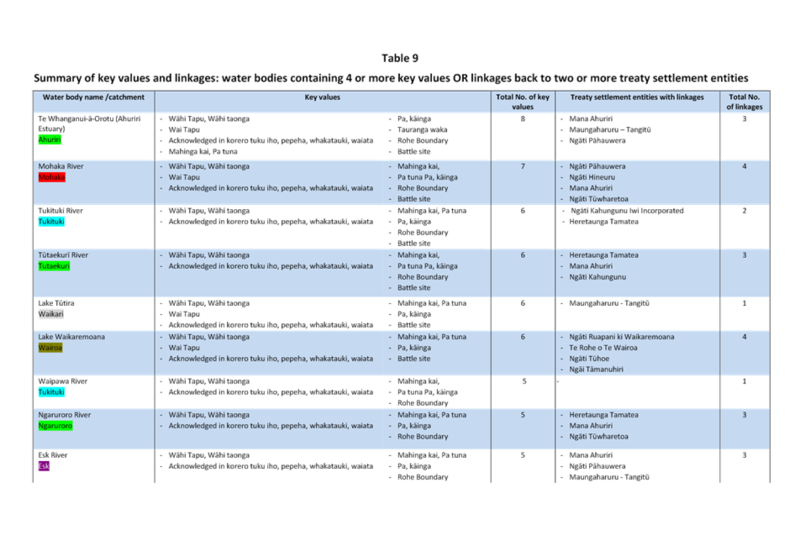 A stakeholder engagement plan was presented to the RPC in September 2017 and since November 2017, there have been a series of meetings with targeted stakeholders. This was documented in the February 2018 RPC paper. Information presented to stakeholders was a synopsis of the Background Information Review and meetings provided the opportunity for stakeholders to ask questions and provide preliminary feedback. 13. An online feedback form for wider public to express views on the plan change has also been on Council’s website for several months. The form asks several questions including views on oil and gas exploration in the region. To date approximately 100 responses have been received from a range of individuals and organisations. All forms of feedback received will inform further drafting options for preparation of the oil and gas regulation plan change. 14. Furthermore, Council staff are currently progressing arrangements for three proposed Hui-a-Iwi across the region in the northern, central and southern parts of Hawke’s Bay. We have been discussing options with the relevant RPC tangata whenua representatives. It is intended that these hui will be a blend of expo-style information boards and presentations led by RPC members themselves (with support from council staff). Dates for these hui have been tentatively scheduled between 9 - 20 April. 15. Following the hui, planning staff and Opus will be preparing advice to bring back to the RPC about options for next steps for the plan change (possibly 2 May or 20 June meeting dates). 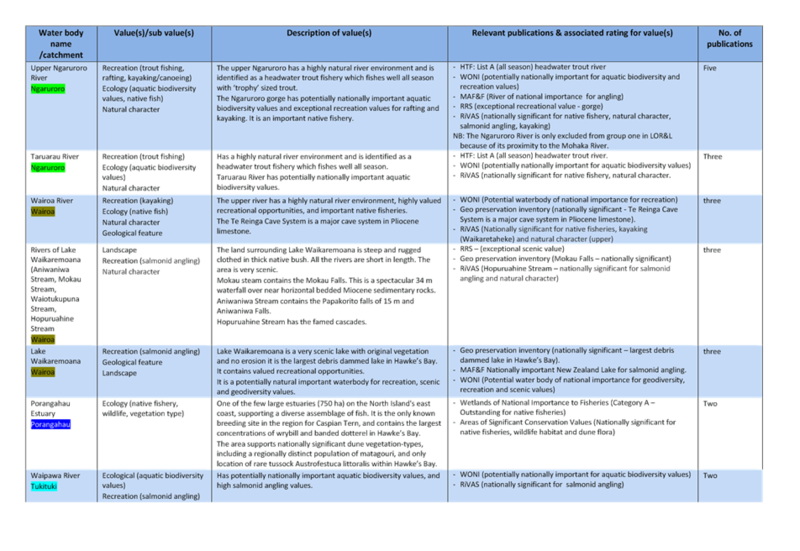 Based on stakeholder feedback, the options could cover anything from dropping the proposal altogether, to advancing with plan change content drafting (plus associated section 32 evaluation reporting). Subject to the RPC’s preferred chosen option new plan provisions can be drafted in readiness for notification of a proposed plan change for the formal public submission phase to begin (optimistically in third quarter of 2018). 16. At the RPC meeting in February, the Co-chairs had indicated a willingness to receive a presentation from the Chief Executive of PEPANZ, with the caveat that staff should provide an outline of PEPANZ’s issues and some brief commentary on those issues. A copy of a letter from the CE of PEPANZ is attached. 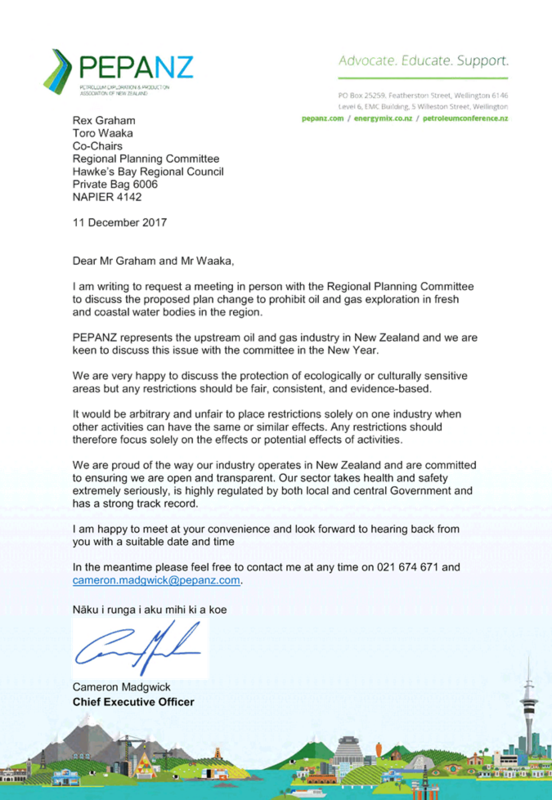 That letter followed a face to face meeting between PEPANZ representatives and several HBRC planning staff. 17. Firstly, it has to be said that PEPANZ is not the only organisation to have provided written feedback on the RPC’s proposals for prohibiting oil and gas exploration activities in Hawke's Bay. A number of other parties have also provided written comments up to this point. 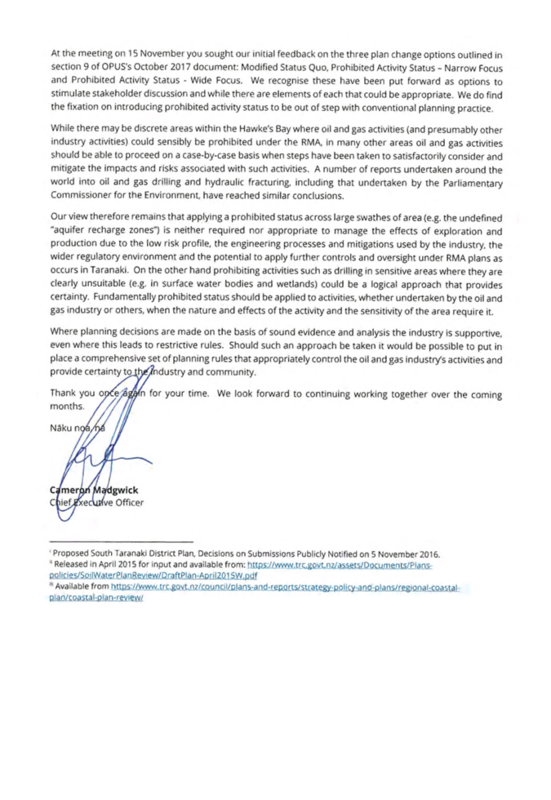 The letter from PEPANZ is self-described as an “initial response” to some of the proposals outlined in the Opus discussion document. 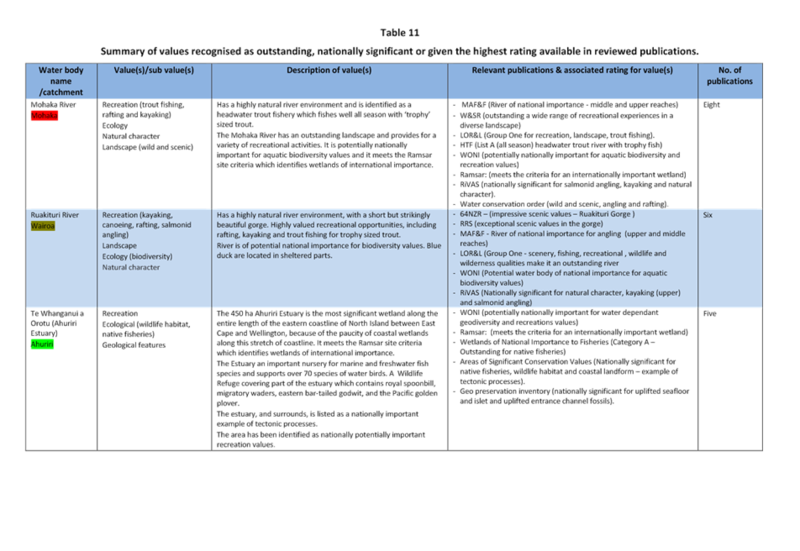 Table 1 summarises key comments from PEPANZ and outlines brief responses from policy planning staff. · While the industry has been operating in Taranaki for several decades, applying a regulatory framework across the industry’s potential operations in Hawke's Bay is not as straightforward as simply copying all the relevant rules from Taranaki’s regional plans. 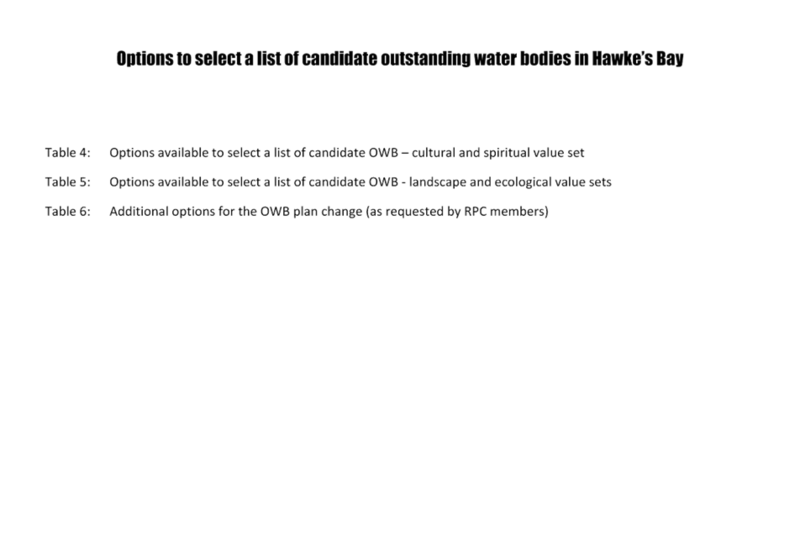 · Existing Hawke's Bay RRMP rules also already classify many oil and gas activities as discretionary, but generally stricter rules are not applicable in sensitive areas. 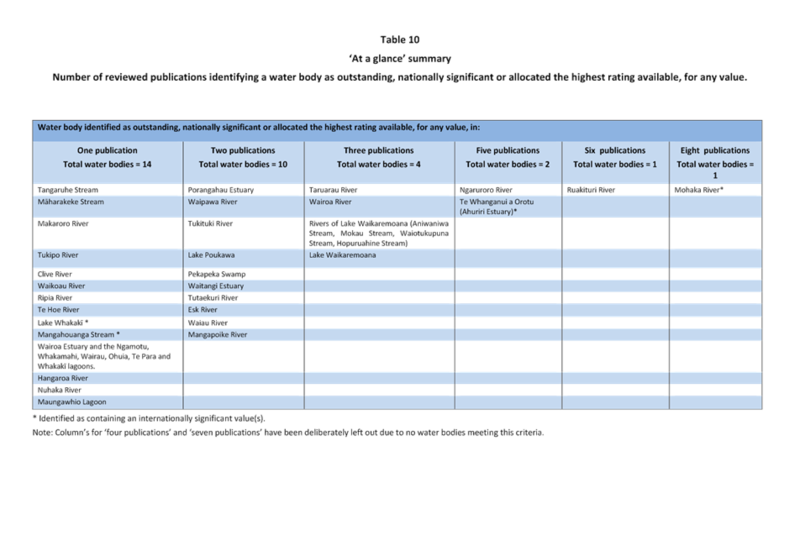 A comprehensive breakdown of what rules apply to various elements of offshore oil and gas exploration have been previously presented to the Committee (for example, refer agenda papers for meetings on 9 December 2014, 16 September 2015 and 23 November 2016). · The existing regulatory regime is the ‘status quo’ option. The RPC has previously agreed the ‘status quo’ is not acceptable and has chosen to proceed with the oil and gas plan change project. 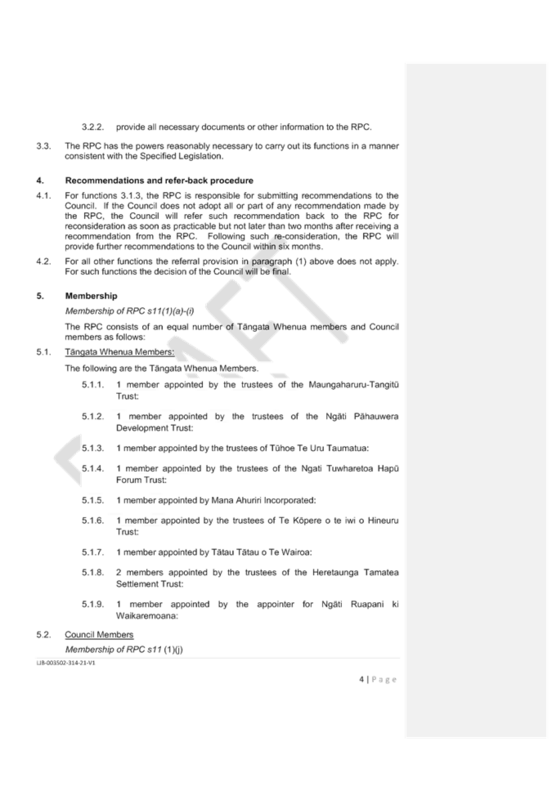 · PEPANZ consider a prohibited activity status across large areas (e.g. undefined aquifer recharge zones) is neither required nor appropriate to manage the effects of oil and gas exploration and production. · There may be discrete areas where oil and gas activities (and other like-industrial activities) could sensibly be prohibited. · While in other areas, each proposal should be assessed on its own case-by-case merits. · Parliamentary Commissioner for the Environment’s earlier reports on this subject reached similar conclusions. · Fundamentally, prohibited activities should be applied to activities where the nature and effects of the activity and sensitive of the area require it – not just selecting oil and gas activities. 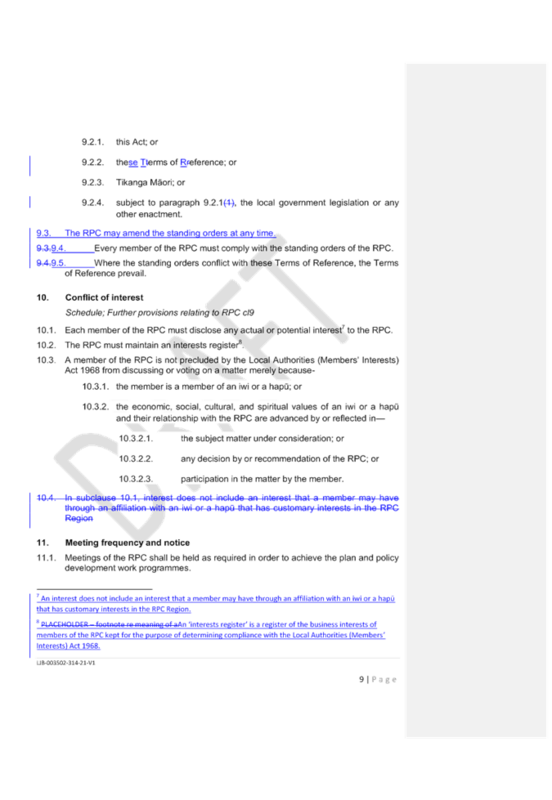 · A prohibited activity status is an entirely legitimate classification that can be used in regional plans. There are few examples across NZ of regional rules tailored for oil and gas activities, let alone characterising what is conventional v unconventional planning practice. · The process of preparing a plan change will inevitably involve an evaluation of various options, and drafting of provisions. That evaluation occurs prior to notification of a proposed plan, and also further evaluations as part of making decisions on submissions received. · Assessment on a case-by-case basis would already occur under the current rules through a resource consent application process. · The RMA was introduced as legislation which was intended to target management of the effects of activities – not the activities themselves. In that way, different activities with similar effects ought to be subject to similar controls. The meaning of ‘effect’ in the RMA includes both positive and adverse impacts, effects with low likelihood and high consequence, cumulative effects etc. · As noted above, preparation of plan changes involve evaluations of alternatives and their respective benefits and costs (e.g. ‘s32’ evaluations). Decision-making should be informed by sound analysis. · Decisions made without appropriate analysis carry risk of challenges by third parties and also being overturned in court proceedings. 18. 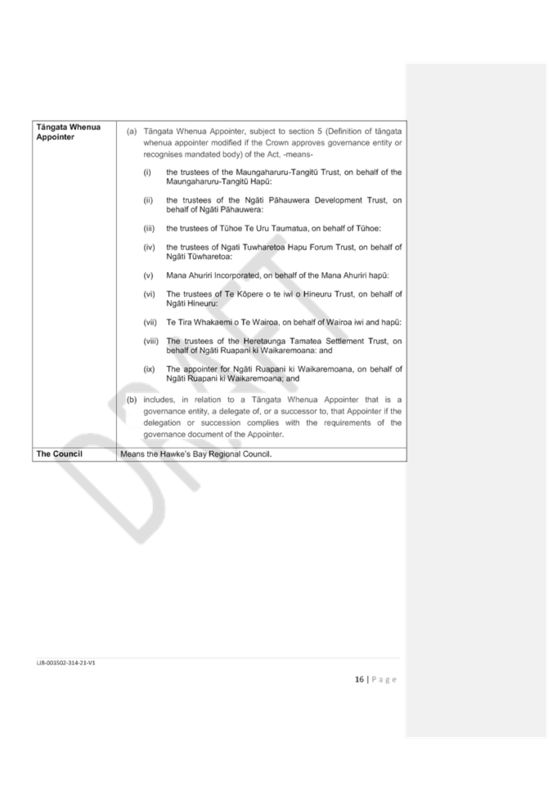 Staff have assessed the requirements of the Local Government Act 2002 in relation to this item and have concluded that, as this report is for information only, the decision making provisions do not apply. That the Regional Planning Committee receives the “Oil and Gas Plan Change Process and Progress Update” report. 1. This paper presents a recently completed report which evaluated the effectiveness of parts of the Regional Resource Management Plan (RRMP). The RRMP effectiveness reporting was undertaken by Philip Mackay of Mitchell Daysh Limited (MDL). The RMA requires councils to regularly (5-yearly) report on the effectiveness of planning documents. Plan effectiveness reporting is different from, but naturally related to, state of the environment annual and 5-yearly reporting frequencies. 2. The scope and purpose of the RRMP effectiveness evaluation was previously outlined to the Regional Planning Committee at its meeting in June 2017. At that time, the project had just commenced having been deferred in the 2017 work programme by other commitments facing the Policy Planning Team, consequently the services of Mitchell Daysh Ltd were engaged to undertake the work. 3. The intent of the RRMP effectiveness evaluation is not a review of the entire RRMP. The RRMP effectiveness review can be thought of as a precursor assessment of what generally works well, what could be done slightly better (or differently) in the RRMP; and what is not working as originally intended. It also needs to be borne in mind that the RRMP’s effectiveness (or at least its influence) does not occur in a vacuum. 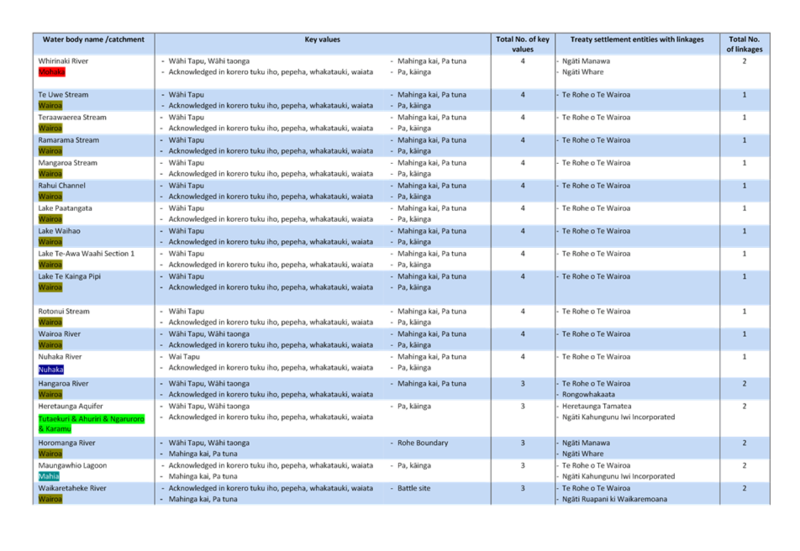 A range of other policy instruments (both local and national) exist – some of which have emerged and/or been altered during the time since the RRMP became operative in 2006. 4.4. 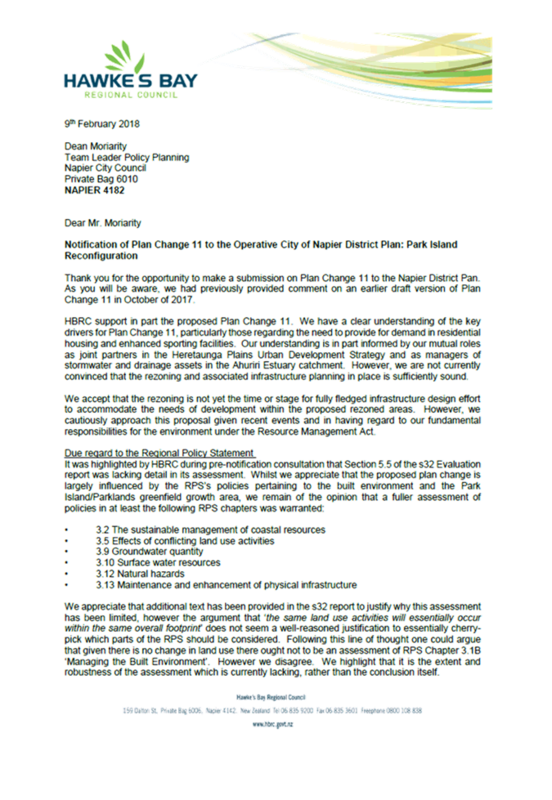 PC 4 (Managing the Built Environment) – one I assume you’re fairly familiar with already. 4.7.4. 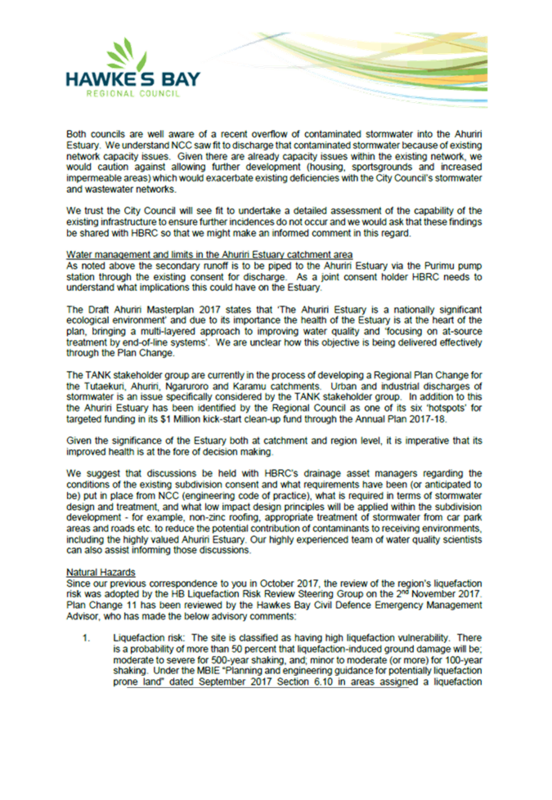 Appending Statutory Acknowledgements to the RRMP as and when emerging from Treaty settlement legislation. 5. MDL’s reporting involved assessing compliance monitoring data, interviews with key staff, policy and consents staff from the city and district councils – all are typically frequent users of the RRMP for a variety of reasons. 6. MDL’s assessment particularly focussed on the RRMP’s anticipated environmental results (AERs) and their corresponding monitoring indicators. One of the key themes of MDL’s assessment of the RRMP AERs is the limited availability of data and information to be able to confirm whether the AERs are being met. A similar theme was encountered in the earlier 2004 RPS effectiveness evaluation. 7. Given the time lag between now and when the RRMP AERs were established in the late 1990s, it is not surprising that modern monitoring programmes do not always match up with those older AERs and associated indicators. While this is not a fatal flaw in the ongoing operation of the RRMP, this does make it difficult to conduct quantitative plan effectiveness monitoring. 8. 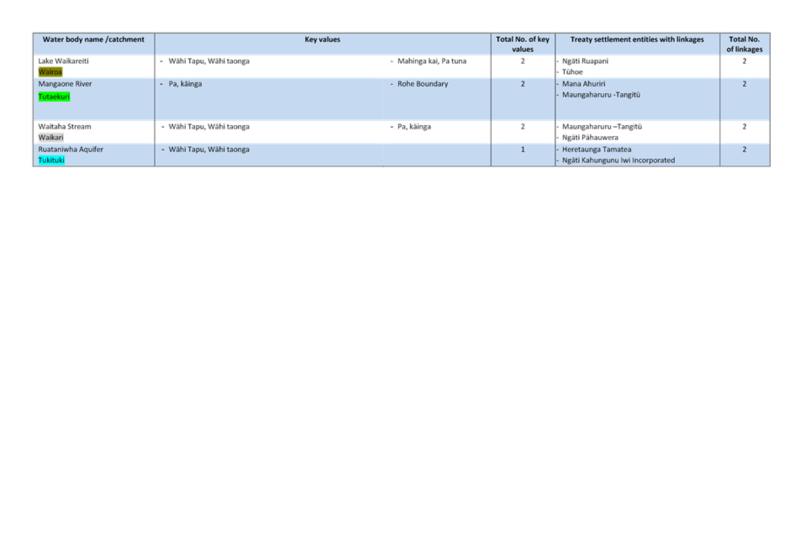 The summary provided in Table 16 of the MDL report (copied below) includes observations of where improvements could be made to various AERs when the opportunity arises through the upcoming plan review/plan change processes. While there is limited information available to verify whether these AERs are being met the proposed wind erosion monitoring programme and the already commenced ‘Soil Quality Monitoring Programme’ should ensure that better time series data is available in the future for monitoring purposes. Questions have however been raised regarding the appropriateness of the ‘sustainable land management’ and ‘sediment deposited in water bodies’ AER wording. Although the AER is being met due to the area of indigenous vegetation under protective covenant increasing every time such a covenant is agreed, the relevance of this AER is questioned as the area of significant vegetation under covenant could be increased even if there was a reduction in the overall area in native vegetation cover in the region. AERs relating to significant indigenous vegetation may be improved by aligning with the HB Biodiversity Action Plan 2017 – 2020 and incorporating ecosystem mapping and prioritisation. A need is identified to make the current RRMP regulatory focus on soil conservation and the district councils’ biodiversity values protection better aligned. This series of AERs are very difficult to measure in a quantitative way, therefore no conclusive statements can be made. Complaints relating to spray drift have been reducing overtime indicating that the associated RRMP objectives, policies and rules are effective, although the compliance team notes that complaint recording can be improved. No conclusions can be drawn on the AER relating to agrichemicals entering water bodies as there is no data available quantifying such incidences. Based on raw complaints data there has been an increase in odour complaints indicating that this AER relating to adverse effects is not being met, albeit that the majority of complaints relate to just four sites. The AER relating to increased composting of organic material is being met in terms of a reduction is such waste entering the regional landfill. The AER for this section is being met as the extraction of river bed gravel is being managed to ensure that its natural replenishment is not being exceeded. Risk mitigation measures are in place in regard to natural hazards so the broad AER is met, while it is noted that the indicator relating to ‘loss of life and property’ is not a particularly helpful measure as it is only of relevance during extreme low return period events. An AER focused on damage to property or injuries could be more useful. As would a specific AER on reducing hazard risk for residential land development. There is little data available on which to verify the achievement of these AERs with similar comments applying as to 3.3 above. It is also noted that the AER relating to soil contamination has become somewhat outdated by the advent of the NESCS. Again, there is no programme of data collection for the AERs in this section to verify achievement or otherwise, although the general complaints data suggests the AER relating to odour is not being met. Council’s Assets Team is comfortable that the AERs relating to the Beds of Rivers and Lakes are being achieved but suggested that the wording of the AERs and associated indicators could be improved. 9. There are no immediate next steps being recommended in this paper requiring a decision from the Regional Planning Committee. The Council’s work programme for preparation and review of planning documents under the RMA is already rather substantial. Committee members will be well aware that much of the work programme’s current focus is on land and freshwater policy. 10. Nonetheless, the 2018-28 Long Term Planning process presents an opportunity to revisit the overall priorities and associated timing of that work programme. The 2015-25 LTP currently signals commencing a review of the RRMP in 2020-21. One of the conclusions in MDL’s report is that the upcoming RRMP review process presents a timely opportunity for a range of matters raised in their evaluation to be considered further and plan provisions consequently amended where relevant. 11. Undoubtedly, by 2020 there will be numerous other matters that the RRMP review will need to accommodate (for example, new or modified national policy statements, new national regulations, national planning standards/templates, etc). 12.1. Science Environmental Monitoring Network review – as presented to the Environment and Services Committee meeting on 21 February 2018, some of the actions suggested as part of the environmental monitoring network review have already been undertaken as part of existing work programmes in a variety of budgets. For example, annual report cards are now produced in lieu of reports, for the State of the Environment annual reporting. Other actions suggested in the EMN Review have been incorporated into drafting of the 2018-28 Long Term Plan, including a move to integrated catchment management approaches and integration of citizen science and Mātauranga Māori. 12.2. IRIS (Integrated Regional Information System) - is a new computer-based system that has been commissioned to manage the core functions and regulatory managements of NZ’s regional councils, including consents, compliance, enforcement, land management and biosecurity, along with contacts, location information and extensive workflow support for business processes. The system includes standardised and customisable workflows that assist councils in following business processes to meet deadlines and keep track of the steps that have been performed in executing the process. IRIS is intended to be operational for HBRC by November 2018. 13. Staff have assessed the requirements of the Local Government Act 2002 in relation to this item and have concluded that, as this report is for information only, the decision making provisions do not apply. That the Regional Planning Committee receives and notes the “Regional Resource Management Plan – Effectiveness Report” report. 1.2. ensure that timeframes beyond the development of draft plan change and the next steps in delivering the plan change are clearly understood. 2. In both the 2009-2019 and 2012-2022 Long Term Plans, Council committed to preparing a regional plan change for the Greater Heretaunga and Ahuriri Catchment Area to review minimum flows and water allocation and to set water quality limits. In 2011 the Hawke’s Bay Land and Water Management Strategy identified the Heretaunga Plains/Ngaruroro catchment as a priority catchment for the Council’s immediate policy work programmes. 3. At that time and as a result of the success of the stakeholder involvement in preparing the strategy, the Council set up a collaborative type process. The resulting TANK Group was initiated to provide the Council with consensus recommendations regarding objectives and policies for a plan change. 4. At around the same time, the Regional Planning Committee (RPC) itself had just been formed a as an interim committee of the Council, prior to legislation being passed for formal establishment of the RPC. 6. The TANK Group has therefore been given the task of identifying the values for which the TANK catchment land and water resources are to be managed. Objectives and measures to ensure they can be met (including rules and limits) are to be developed to meet the needs of those values. 7. This TANK project was intended to ensure a robust and community led process to understanding the issues and developing solutions facing the freshwater resources and its people in the TANK catchments. In setting up the TANK Group, the Council has enabled a more inclusive approach to water management that reflects the diversity of community views. It was believed that this had the potential to result in a plan change that more accurately accounts for these views and provide innovative solutions that recognise all of the responsibilities the community holds for water management. 8. As the TANK Group progresses towards this, it is also apparent that there is a significant willingness by stakeholder participants to be involved in the implementation of the plan through potentially new management frameworks, beyond the adoption of the plan change. 9. The RPC will need to be assured that the recommendations of the TANK Group do accurately reflect the wider community views and water values and provide solutions that adequately and efficiently meet the objectives set (as well as obviously being lawful). The process that Council and the TANK Group has used in developing the plan change and the ways in which it has involved community and stakeholder groups will be important aspects of this assessment. In particular the RPC members will be interested in understanding what tangata whenua involvement there has been and how well legislative requirements are achieved. 10. The Section 32 evaluation report which will accompany the plan change will also be a critical document for the RPC. The s32 report will document the assessments done on the effectiveness of the proposed objectives (and principal alternatives) in achieving the purpose of the Act, NPSFM and other national planning documents etc. That report will also outline the costs and benefits of the methods chosen, and assess alternative options that were considered and enable the RPC to assure themselves the provisions in the proposed plan change will be effective and efficient. 11. There will be several further briefing papers presented to the RPC in the coming months regarding choices to be made on both the TANK plan change process and draft content. However, none of those decisions need to be made at the RPC’s meeting on 21 March. 12. The purpose of the Hawke’s Bay Regional Planning Committee Act 2015 is to improve tangata whenua involvement in the development and review of documents prepared in accordance with the RMA for the Hawke’s Bay Region (section 3). By extension, the Act confirms that the purpose of the Regional Planning Committee is to oversee the development and review of those same documents (section 9(1)). 13. The Regional Policy Statement (RPS), which is combined into the Regional Resource Management Plan (RRMP), and the Regional Coastal Environment Plan (RCEP) are the Council’s three most important RMA planning documents. Preparation, review and changes to those planning documents are not only a core function of the Regional Council, but one that is essential for Council to carry out its functions under section 30 of the RMA. 14. Since its formation in 2012, the RPC has yet to fully complete a journey with overseeing a proposed change to either the RPS or the RRMP. However, the RPC has had involvement in plan change 6 before and after PC6 was called-in and heard by a Minister-appointed Board of Inquiry. Similarly, the RPC had overseen preparation of Change 5 which remains partly subject to an appeal in the Environment Court, so Change 5 has not yet fully completed its ‘journey’ to an operative state. 15. It is anticipated that the RPC will be presented with two or potentially three proposed plan changes this calendar year (i.e. TANK, outstanding waterbodies, oil and gas regulation). 16. As a part of NZ’s plan development framework, in certain circumstances of national significance central government specifies how it expects councils to achieve outcomes under the RMA. 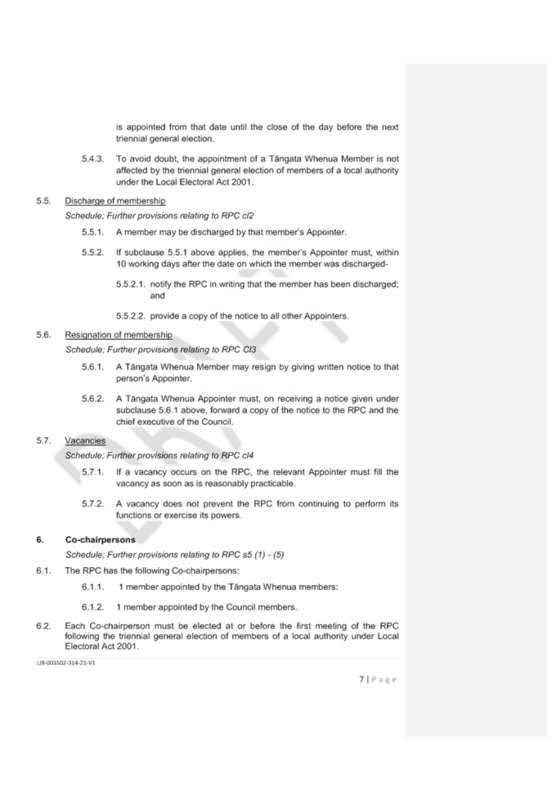 National policy statements, issued under section 52(2) of the RMA, are one such instrument. The National Policy Statement for Freshwater Management 2014, as amended in August 2017 (NPSFM) must be interpreted and given effect to within the context of the RMA. 17. The NPSFM requires regional councils to make or change regional plans to ensure they establish freshwater objectives and limits – then establish methods (including rules) to achieve them. HBRC must give effect to the NPSFM in its RPS and its RRMP. Where existing plans and policy statements do not already give effect to the NPSFM, they must be amended by 31 December 2025 (or by 2030 if the 2025 timeframe will affect plan quality or it would be impracticable for the council to fully implement the NPSFM by 2025). 18. It should be noted that the NPSFM is not the only national direction that councils must give effect to. There are several other national policy statements and national environmental standards that councils are also obliged to implement in RPSs, regional plans, district plans and/or resource consent decision-making. 19. To meet its NPSFM obligations, in 2012 HBRC elected to undertake a plan change using a collaborative process via the TANK Group (the process for engagement with the stakeholder group was endorsed by the [then] Environment and Services Committee on 15 August 2012). 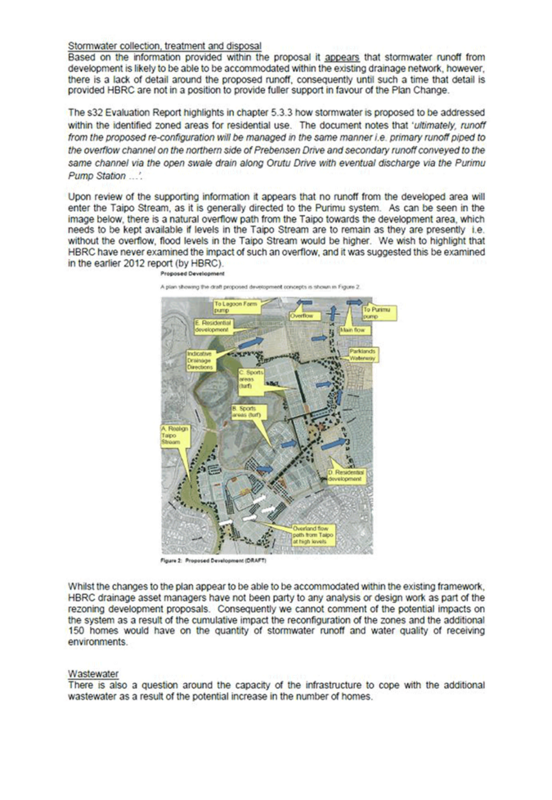 The terms of reference for the TANK Group states that the role of the group “is to provide the Council (via the Regional Planning Committee) with consensus recommendations regarding objectives, policies and methods, including rules for a plan change to the RRMP for the Greater Heretaunga and Ahuriri catchment area.” The TANK Group consists of a broad cross-section of the community within those catchments, including mana whenua representatives, primary sector representatives, councils and NGO representatives (totalling over 30 members). The Group has operated under an agreed terms of reference since 2012, which has been periodically updated. 20. It should be noted that the establishment of the TANK Group pre-dates the RMA’s new pathway option for a highly prescriptive ‘Collaborative Planning Process’ when preparing plan changes. Accordingly the RMA provisions for collaborative planning processes, which include restricted grounds for appeal to the Environment Court, do not apply to the TANK plan change. 21. To date the TANK Group have concluded 37 meetings. The Group have been meeting on a regular basis to discuss issues on water quality and quality, and of recent times, meeting monthly with the aim of delivering a draft plan change to RPC for consideration and adoption mid-2018. There have also been Working Groups formed to deal with specific ‘topics’ or areas of key interest. These Groups consist of HBRC staff and members of the TANK collaborative Group and cover Community Engagement, Stormwater, Lakes and Wetlands, Economic Assessment, Mana Whenua and Water Augmentation. These working groups meet irregularly according to the issue being discussed, but the frequency of meetings has increased over the last year with some groups meeting more than monthly. Furthermore, the Group is also receiving advice from a Farmer Reference Group, which was set up to assist in understanding how the sediment management issues could be met. The Group has also attended a number of topic specific workshops and a number of field trips, including one with the Reference Farmer Group to hear about how the sediment management framework could operate. 22. It is the expectation of staff that the TANK Group will be in a position to provide those recommendations to the RPC in the form of a draft plan towards the middle of this year. This will include an assessment of where the Group formed consensus opinion and where it has not. 23. Committee members are no doubt aware that TANK plan change doesn’t start from a blank canvas. The TANK plan change will need to be designed to fit amongst the RRMP’s existing regulatory provisions and also alongside a number of existing national standards etc. 24. Previously, the RPC has agreed to have particular regard to any TANK outcome, if one emerges, and the Council has given a good faith undertaking to implement the recommendations of the TANK Group. This acknowledgement of the effort and recommendations of the TANK Group has been hugely motivating for members, and is certainly a position that the TANK Group will be concerned that Committee members take into account during the RPC’s own decision making processes. 25. During these past 5 years, in excess of 20 verbal or written reports have been presented at RPC meetings, ranging from scientific presentations, discussions around the TANK/WCO process, and general updates on the process and progress being made under the collaborative framework. 26. All information and presentations given to the TANK Group since the beginning of 2016 has been publicly available on the Council’s TANK webpage. In addition to the regular “Think Tank” updates and meeting records, all RPC members have had a standing invitation to attend all TANK meetings as active observers. 27. There will certainly be additional briefing papers and presentations to upcoming RPC meetings over the remainder of 2018 in relation to draft and proposed versions of the TANK plan change, plus associated documents like the section 32 evaluation report. 28. There are requirements for the council to consult a range of specified organisations in the preparation of a plan change including the MfE, local authorities and tangata whenua through iwi authorities. These obligations have been met in a large part through the TANK collaborative process and the adequacy of this will be subject to RPC oversight. Discussion of plan change matters by the RPC alone does not constitute proper consultation with tangata whenua through iwi authorities. (e) indicates how those issues have been or are to be addressed. 30. It follows that the TANK mana whenua group’s role in the collaborative process, supported by Council has enabled the TANK process to provide consultation and involvement by mana whenua in a way that meets the RMA’s requirements. This is relevant not just in terms of the TANK Group’s preparation of the draft plan change, but also in anticipation of the wider, RMA-mandated, consultation with iwi authorities. The more robust the wider tangata whenua involvement has been throughout the plan development, the less onerous the task in front of the affected Māori community. 31. 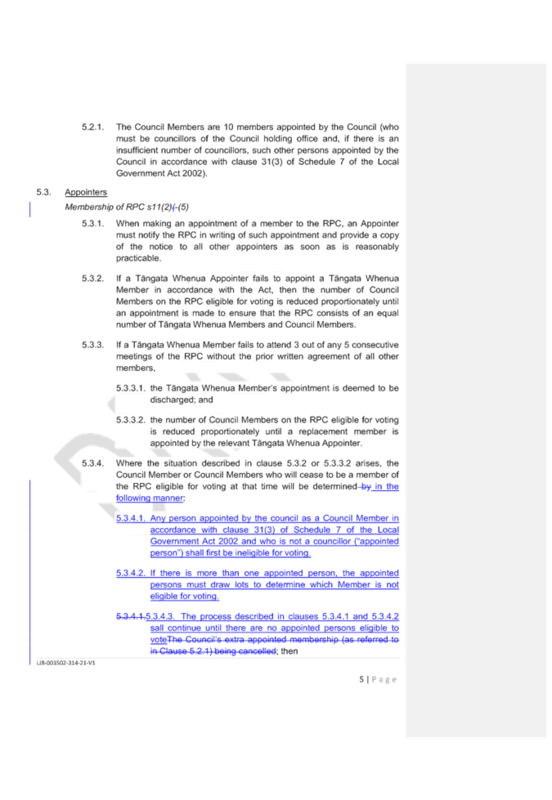 Figure 1 sets out the formal stages of a plan change pathway including indicative timeframes. In terms of context, the extensive TANK Group process to date is noted as being a comprehensive input into the first step of the much more formal proposed plan stages identified in Figure 1. 32. Releasing a draft plan change for informal public feedback is an entirely optional action that councils can take. 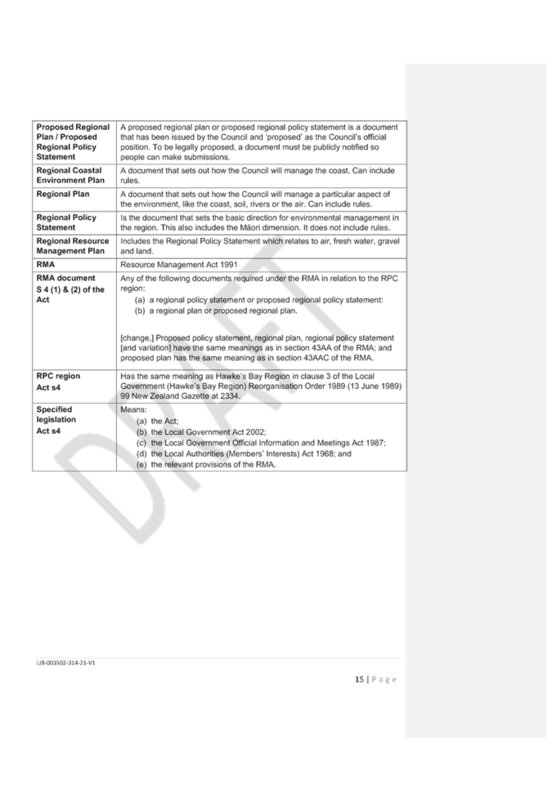 In the case of the TANK plan change, the Council will need to consider whether there is merit in undertaking any optional wider consultation on a draft Plan Change once it has been prepared by the Group or whether to skip directly to public notification of the plan change and the formal submission phases that follow. It would be premature to make that decision now, but the RPC will need to think about that choice in the next few months when the TANK Group’s drafting and extent of consensus becomes clearer. 33. 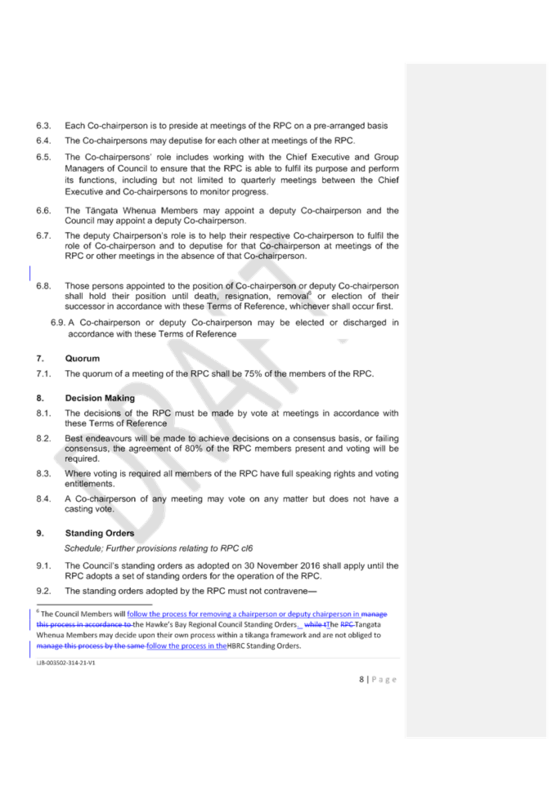 Prior to notifying a plan change the Council must provide a copy of the relevant draft plan change to iwi authorities (those affected by the plan change). It is required to provide adequate time and opportunity for the iwi authorities to consider the draft Plan Change and provide advice on it (note this is a recently new clause under the RMA, Clause 4A, Schedule 1). There is no guidance of what ‘adequate time’ is under the RMA. Recent advice received from MFE officials indicates that the council itself is able to determine what ‘adequate time’ is in the circumstances of any particular plan change. Prior involvement of tangata whenua and iwi authorities in the plan change preparation phases will no doubt have a strong bearing on the short or lengthy timeframe for inviting iwi authorities’ comments on the draft plan change. 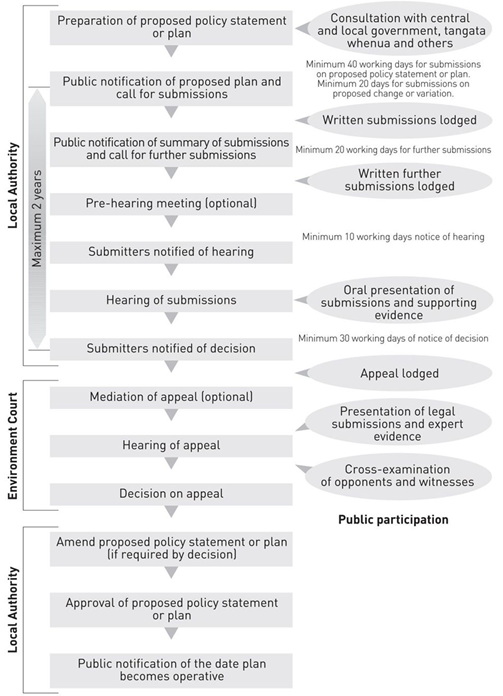 Figure 1 – formal stages and steps of a proposed plan change process by RMA Schedule 1. 34. The TANK staff project team has recognised the on-going issues surrounding appropriate representation by mana whenua on the TANK group. The establishment of the TANK Group in 2012 was also at a time of change for Māori in the region, through Treaty settlements and the establishment of the RPC. Changes to TANK membership were made to ensure the relevant Treaty settlement entities and iwi authorities were given the opportunity to attend and also to ensure the plan change development and RPC member roles were properly recognised. 35. While some unresolved issues about mana whenua involvement around the table still remain, there has been wide acceptance of the need to provide the TANK project with the best available mana whenua input and involvement as possible. 36. The mana whenua TANK members have produced reports documenting values and attributes for surface water resources for the Ngaruroro and Tūtaekuri Rivers. The task involved holding a series of workshops, wananga, hui-a-hapu with mana whenua, to consolidate views and the values they held within various areas and reaches of the Ngaruroro and Tūtaekuri catchments. During these workshops the TANK plan change process was explained and key Maori concepts and values relating to the rivers were explored and agreed. Then specific areas where these values apply were discussed, researched and spatially prescribed. Attributes were confined to water quality and water quantity measures. This work complements but does not replace, the iwi/hapu management plans received by the Council relating to the TANK catchment area. 37. The TANK Mana whenua group has typically met before each TANK Group meeting to prepare for efficient collective engagement during the TANK stakeholder discussions. To avoid confusion with the role and mahi of mana whenua group not involved in the TANK project, the TANK Mana Whenua Group has renamed itself to become known as the TANK ‘Treaty Partner Working Group.’ Members of this group often engage with their ‘parent’ organisations. For example, the Heretaunga mana whenua engage with Te Runanganui ō Heretaunga to inform marae representative of progress and receive feedback on a six weekly basis. The TANK Treaty Partner Working Group meets regularly with HBRC project staff between TANK stakeholder meetings to progress and advance and progress the plan change. 38. Given the scale and complexity of the TANK catchment, its extreme degree of modification over many years (including the significant impact of urban environments), the competitive tension for access to and the use of natural resources, and the absolute significance of the cultural and spiritual values throughout the catchment, it must be noted that the first draft of the plan change, as reviewed and approved by the RPC, will be the subject of considerable local, regional and national scrutiny. 39. It is critical to emphasise that staff operate under the statutory obligations laid down by the NPSFM and which requires Council to advance a plan change to those address the challenges and issues around freshwater. The Council must manage our freshwater to provide for all the values which are listed as national values and they include compulsory values for ecosystem health and human health and a range of other values including; cultural, social, environmental, quality, health, availability and economic values. The NPSFM also requires management of freshwater in a way that considers and recognises Te Mana o te Wai. The NPSFM and Section 32 of the RMA both require that in developing the Plan there is also consideration of the impacts of any choices made and their implications for resource users and people and communities i.e. cannot simply let one interest group unreasonably dominate the plan change without creating an inevitability of lengthy and expensive appeals to the Environment Court. 40. Staff recognise that many stakeholders (including RPC members) are anxious and impatient for Council to progress the necessary changes to its regional management and planning frameworks (via the likes of the Tukituki and TANK plan changes) so that the communities’ aspirations, as manifested in national policy instruments like the NPSFM, can be implemented at ground level. In this regard the importance of the role of the RPC in progressing this and other NPSFM plan changes cannot be understated, because these types of regional plan changes are fundamental to setting out clear policy direction for the Council’s functions under the RMA. 41. Staff have the highest regard for the effort, commitment and outputs of the TANK Group and firmly believe the combination of the Group’s expression of the breadth of community values, together with their own expertise in land and water science, ecology, land management, consenting, regulatory and planning (which should also not be underestimated) will result in a reasonably robust first draft for the RPC’s consideration. 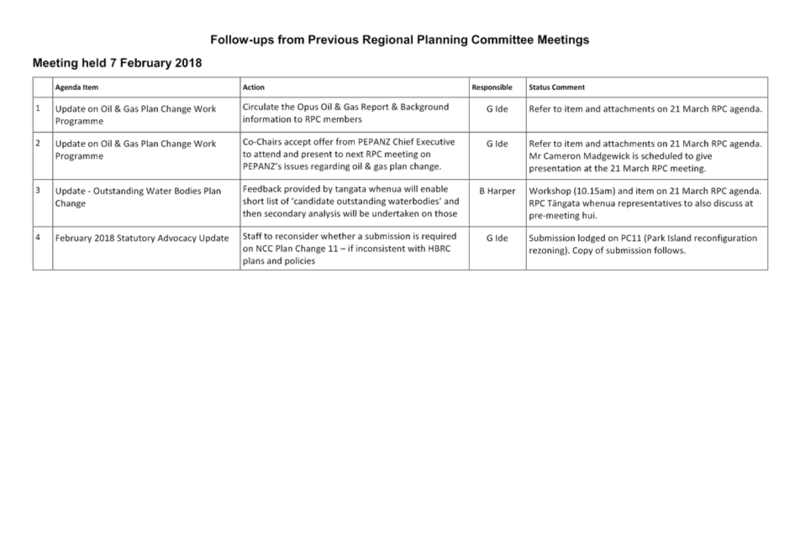 42.7. options for public notification, submission timeframes, and arrangements for the hearing phase of the plan change process. 43. Staff have assessed the requirements of the Local Government Act 2002 in relation to this item and have concluded that, as this report is for information only, the decision making provisions do not apply. That the Regional Planning Committee receives and notes the “Pathway to draft TANK plan change adoption by RPC” staff report. 1. This document has been prepared to assist Committee Members to note the Items of Business Not on the Agenda to be discussed as determined earlier in Agenda Item 5.